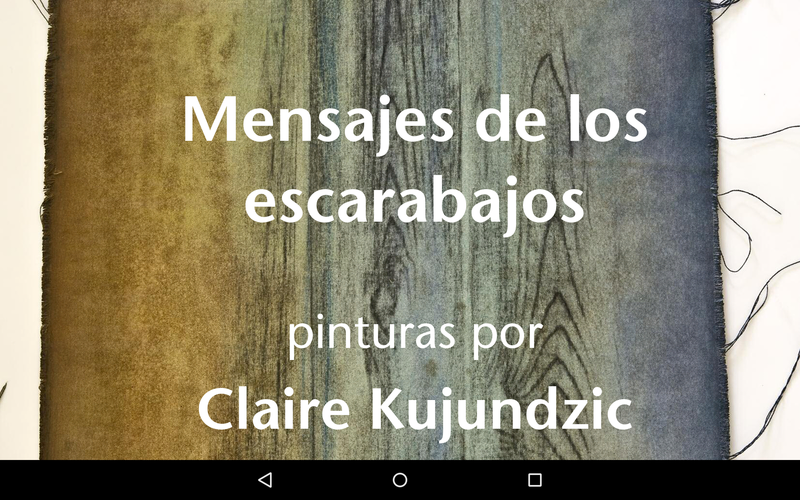 Last fall Claire Kujundzic and I received an invitation from GKo Gallery in Tolosa in Basque Country to exhibit our work in April. 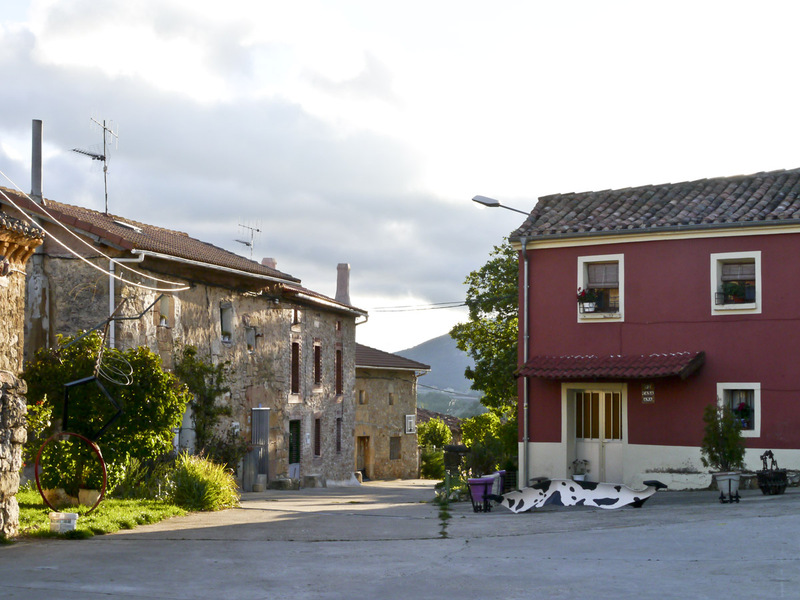 I had been wanting to return to Tolosa and the surrounding area where I had been in October, 2013 while apprenticing in paper making with Juan Barbé at his Eskulan studio in Zizurkil (see blog posts from that period). While there, I had met Garikoitz at GKo, thanks to a tip from Brian Cullen at the visitor centre. After discussing the invitation for about one minute, we decided to go, even if we weren’t successful accessing some travel assistance from the BC Arts Council or the Canada Council. In January I started making inquiries about the best way to deal with bringing our art through Spanish customs and back to Canada. Melissa Gruber at CARFAC National kindly wrote the Canadian Trade Commissioner in Spain to ask about proper documentation, taxes, etc. 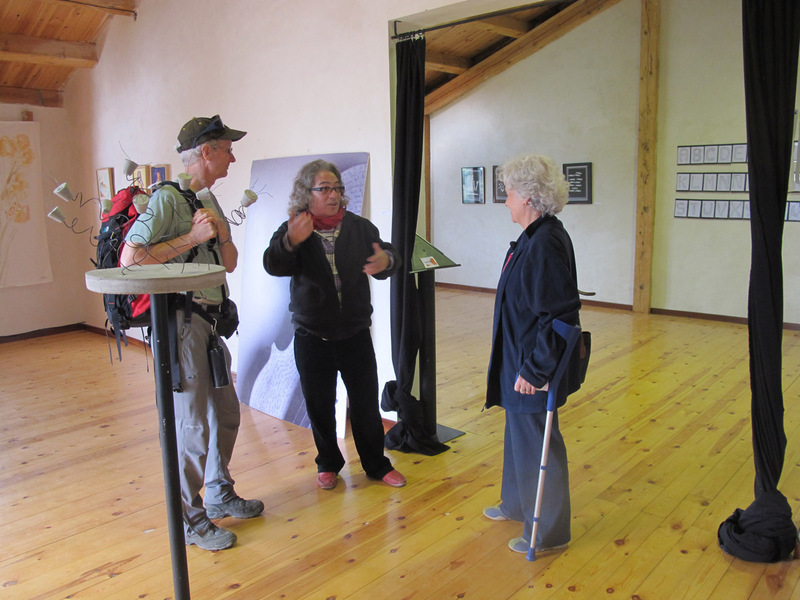 Susan Madsen, Richard Tetrault and Gregg Simpson shared their art travel experiences, which was helpful. In the end, following the advice of a customs broker in Bilbao, we paid the Canadian Chamber of Commerce $315 + a deposit of 40% of the retail value of our work in order to have an ATA-Carnet document. Supposedly this is the simplest way to deal with temporary imports. 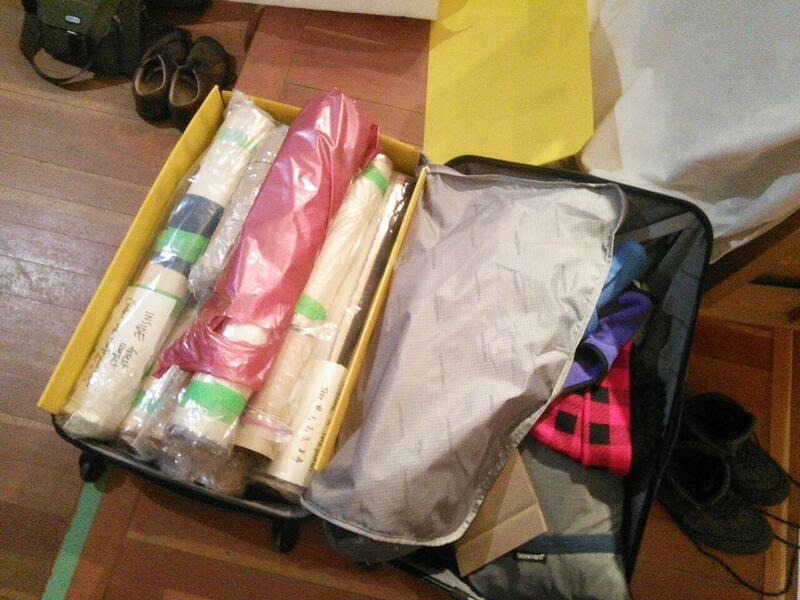 Claire took charge of packing our artwork. Except for two larger prints, I was showing small and miniature silkscreens, all matted with archival backings and ready to pin to the gallery walls. Claire’s canvas paintings and “trees” could roll up, and everything fit in our suitcases. We didn’t have to carry any wooden cleats for her paintings, as Garikoitz had offered to cut them at Box.A Arte Elkarte’s workshop. And we didn’t have to squeeze any metal rings into our luggage, because Juantxo Garmendia’s website was very kindly making two custom rings for us, complete with little hanger loops, at his workshop in Atseasu. He is an artist-wizard with steel and iron! A week before leaving Wells, where we had had the mildest winter in 20 years and the least amount of snow anyone could remember, we changed our tires back to summer treads from winter. Naturally, a few centimetres were waiting for us when we left home at 6 am, and a bit more on the plateau south of 100 Mile House! We reached Vancouver in time for a short, but lovely visit with Alan Zisman and Linda Read, who generously loaned us Kate’s old (new to us) smartphone, plus a nifty charging expansion cable. Then Susan Madsen and Stephen Mitchell generously hosted us overnight with a delicious supper and breakfast, then driving us to the airport. We are so fortunate to have such fine friends! After visiting customs with our ATA-Carnet, we boarded Air France Vancouver-Paris-Bilbao. 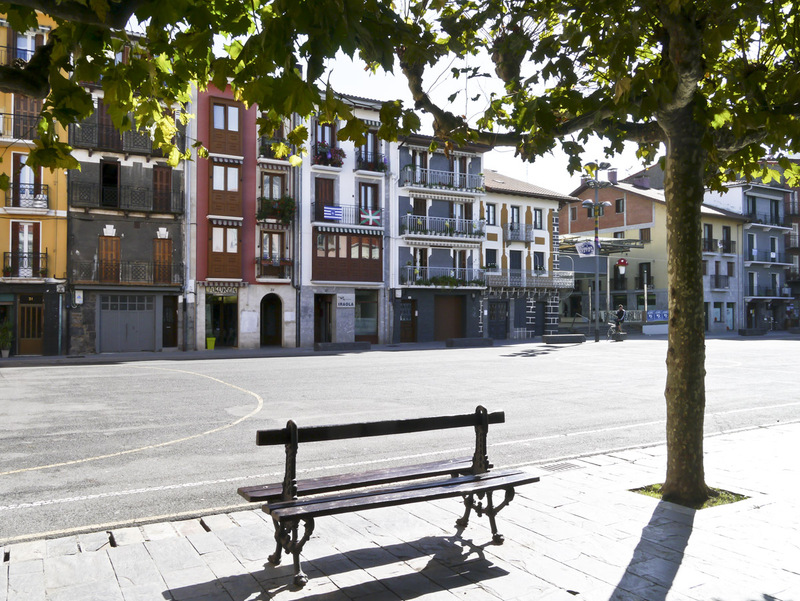 This entry was posted in art, Euskal Herria, Spain and tagged art, Basque Country, Euskal Herria, Toloa on April 23, 2015 by Bill Horne. Several weeks ago when Claire and I stopped by Two Rivers Gallery in Prince George, BC to deliver my work for their North exhibition, Carolyn Holmes kindly told me an introductory workshop to laser cutting was taking place in their makerLab that evening. 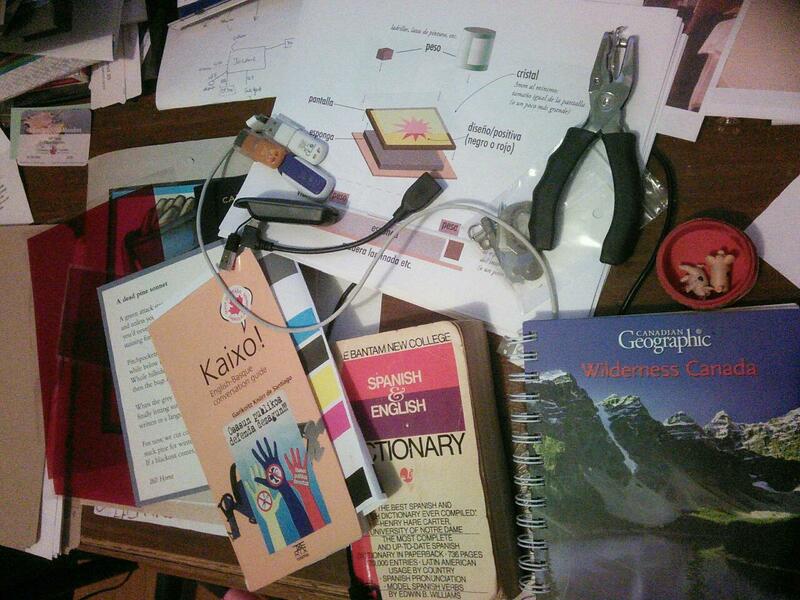 We decided to stay overnight, and Kathleen Angelski, the makerLab Coordinator, led an excellent two hour session. Later, on one of our return trips to Prince George during the Canada Winter Games, Kathleen helped me laser cut a pine beetle pattern and a cedar bark pattern on matte board and on yellow cedar blocks. 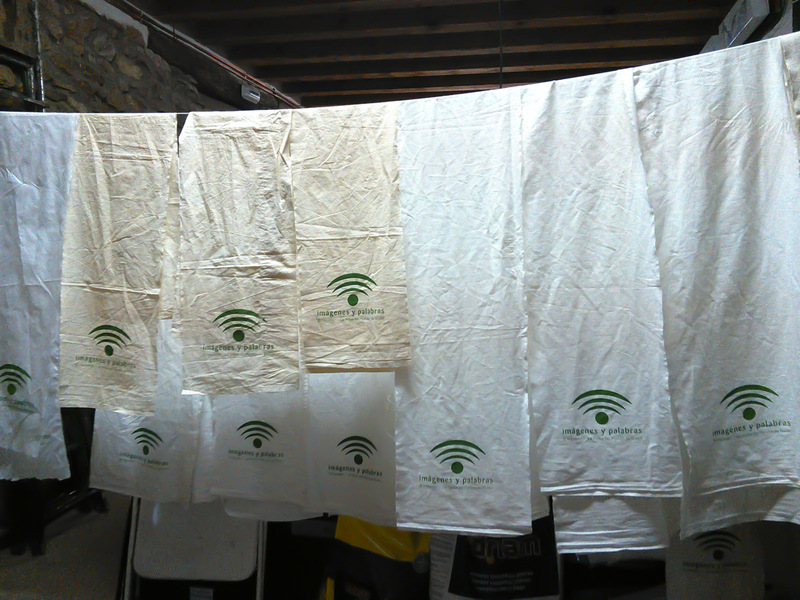 My plan was to take them home to try silkscreening the remaining surfaces with water based inks. 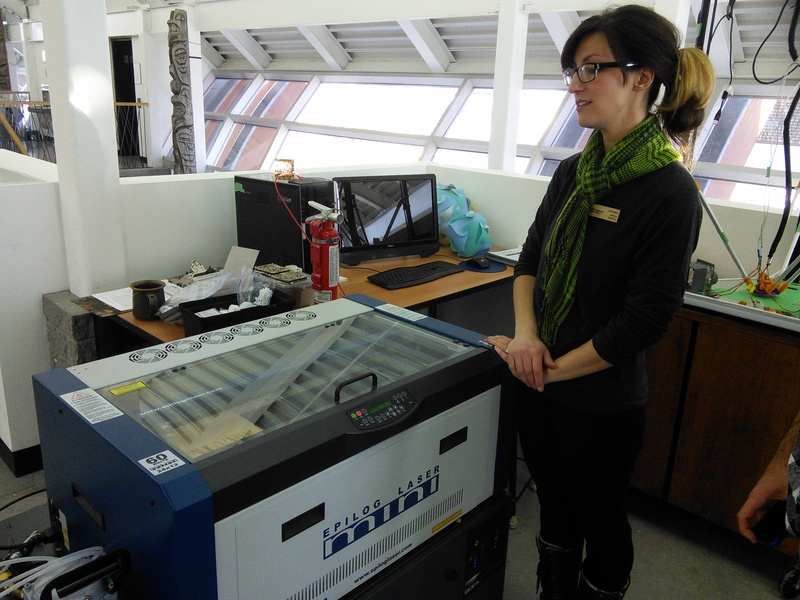 Kathleen monitors the laser cutter while it engraves a bark pattern in yellow cedar. 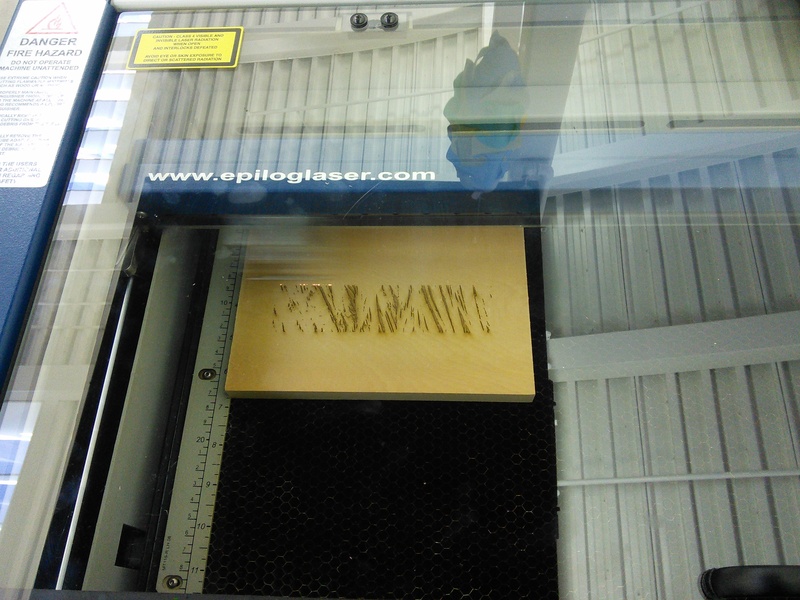 Yellow cedar block inside the laser cutter, half way through its engraving. To be efficient, I planned to “gang” all my film positives for the two different prints onto two medium-sized silkscreens. In case I misprinted my laser cut matte board and yellow cedar blocks, and to take advantage of setting up to print 11 colours, I decided to extend my editions by printing some on paper. 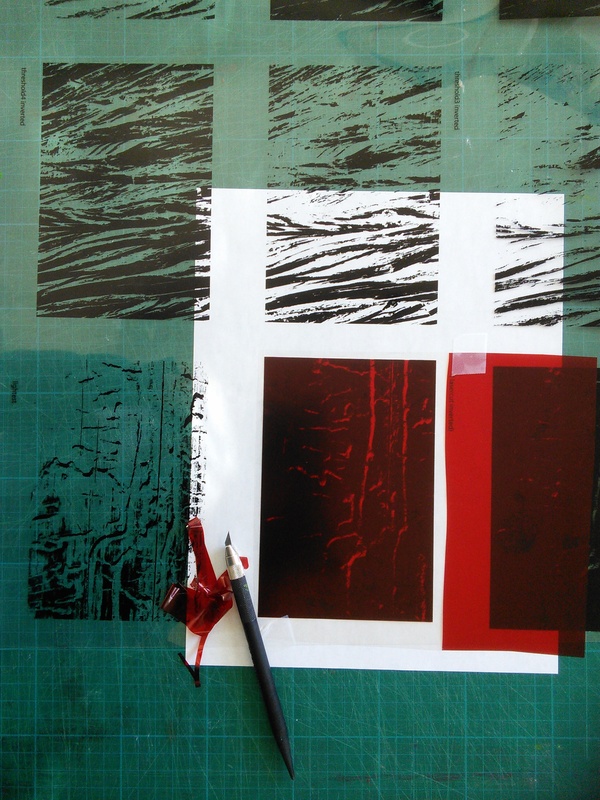 Since the paper was unengraved by the laser cutter, I needed to hand cut some red ruby masking film (aka Rubylith) to make a stencil to print solid background colours for the paper prints. I wouldn’t print a solid rectangle on the engraved materials, as it might puddle in the grooves. Instead, I made a stencil of the exact reverse of the engraved areas with a 2 pixel stroke to accommodate for registration slop. This would be a tight job! 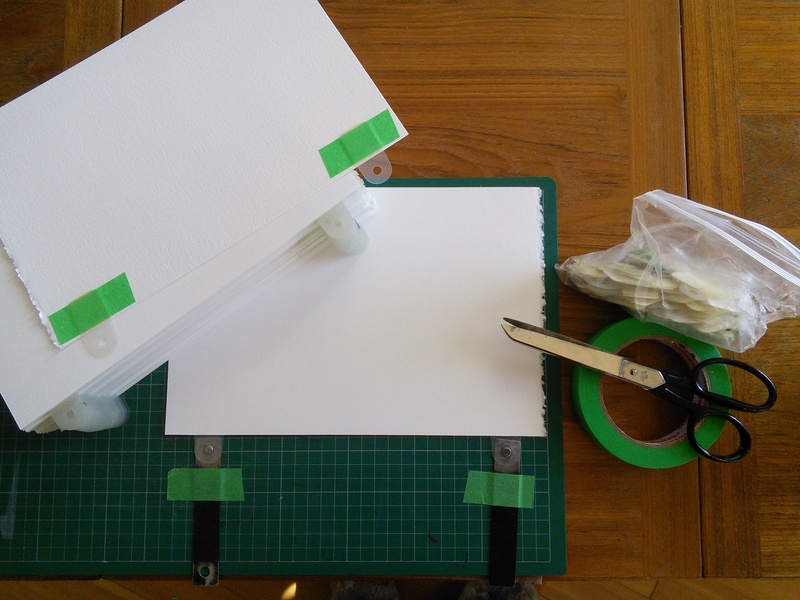 Taping paper prints with register tabs; sample film positive indicates approximate print location. 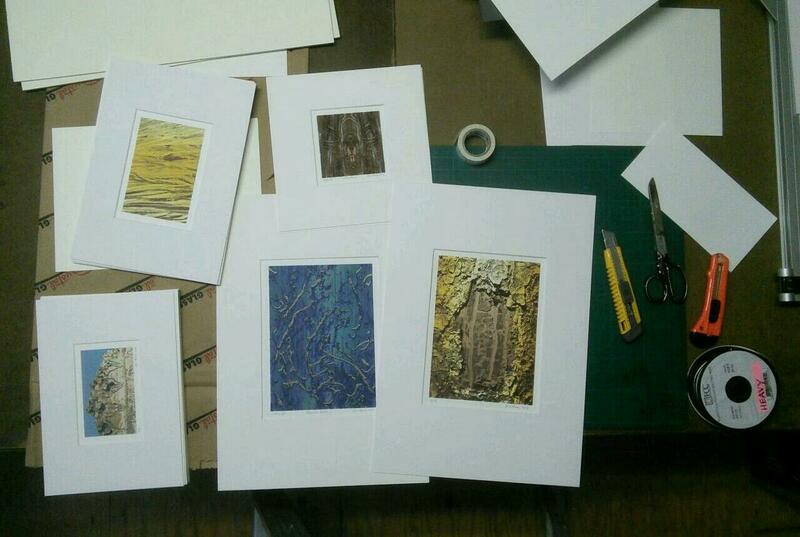 All paper prints now taped with register tabs. Because I had ganged six and five stencils respectively on two screens, I blocked the non-printing areas with wax paper; when I finished printing a stencil, I coated it with photoemulsion and re-exposed it in sunlight to make a water-resistant blockout. 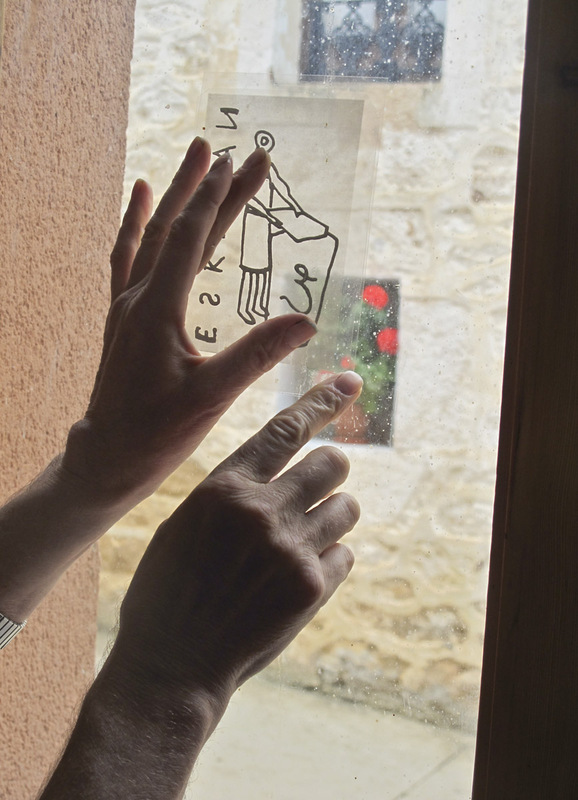 Wax paper blocks out other stencils ganged onto screen. 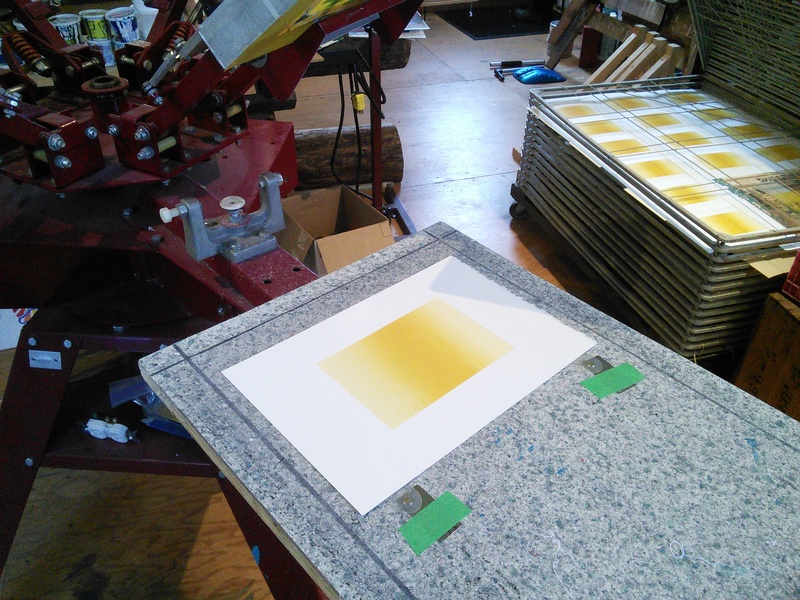 Printing warm gradients for the cedar bark prints on paper. Warm gradient print in register. 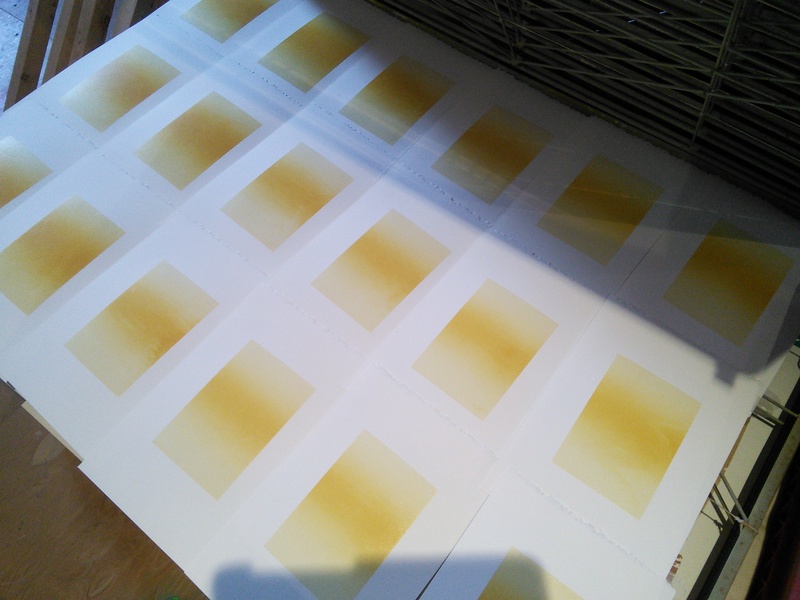 The warm gradients printed and drying. 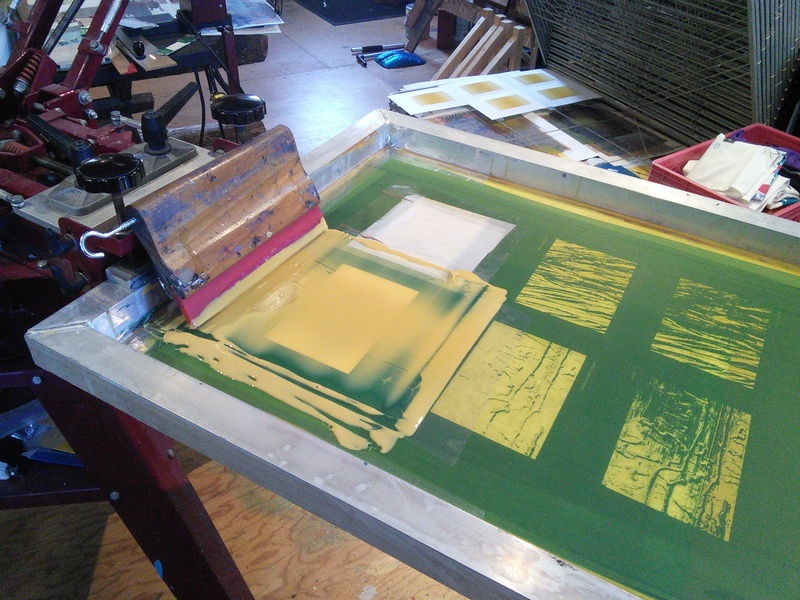 To print on the yellow cedar blocks, I had to elevate the screen and re-register using scraps of the same material. Wooden bar inserted in to elevate screen to same level as the yellow cedar blocks. 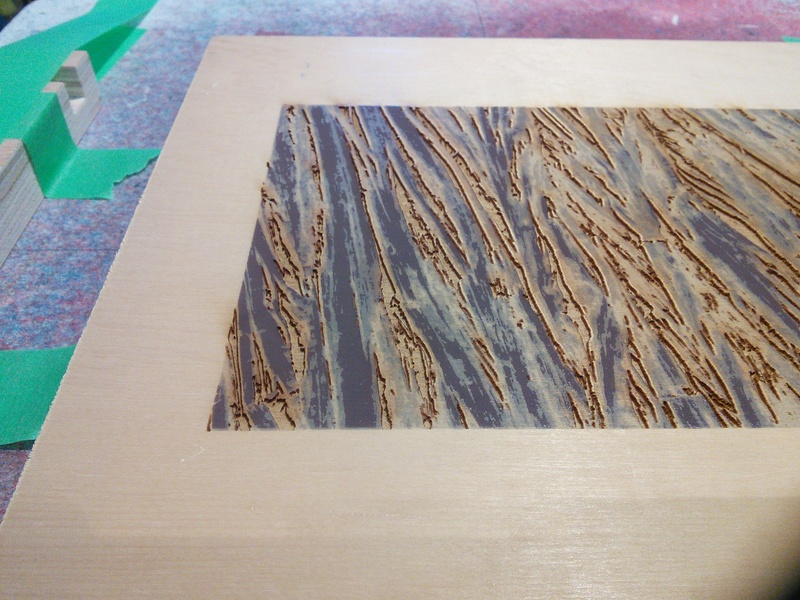 Yellow cedar block in register, freshly printed with another colour. 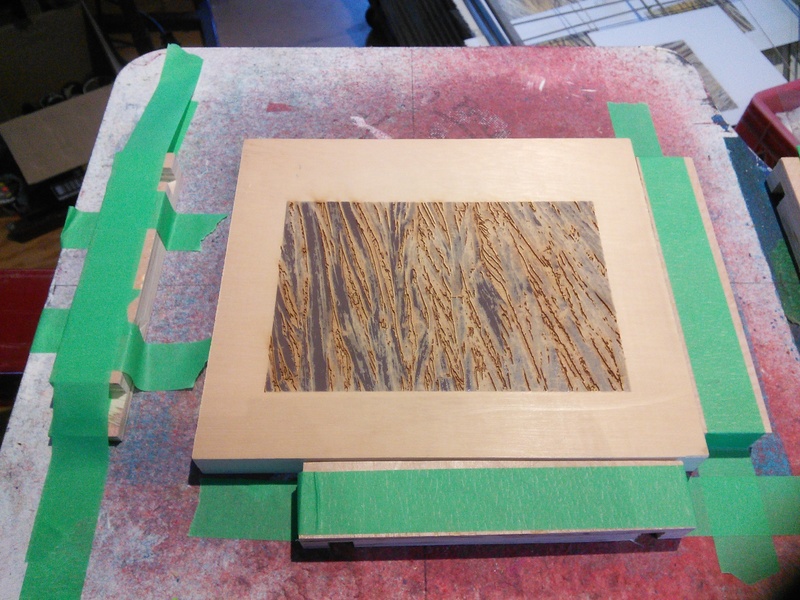 Closeup of yellow cedar; one more colour to print. 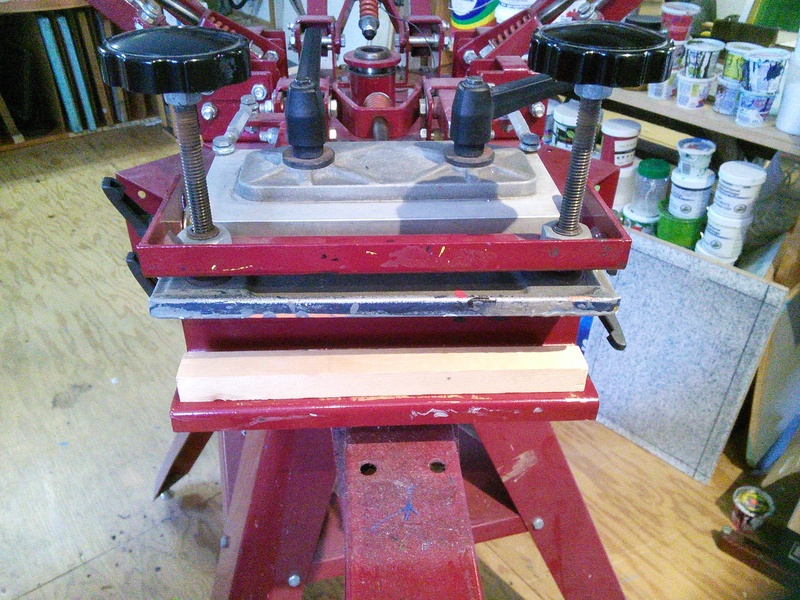 Using a 4 station rotary t-shirt press made it easy to shift the screen out of the way to see more closely when adjusting the alignment of my blocks, matte board and paper below the freshly printed registration mylar, and accurately set my registration systems. I remain very grateful to my brother-in-law, Ian Crawford, who found this used press for me at a Victoria garage sale! 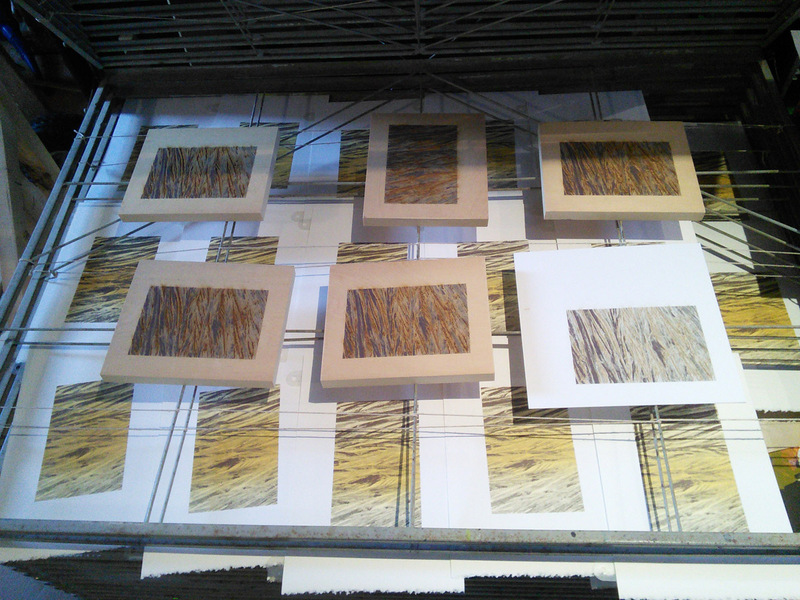 One more colour to print; paper, matte & wood blocks drying on rack. 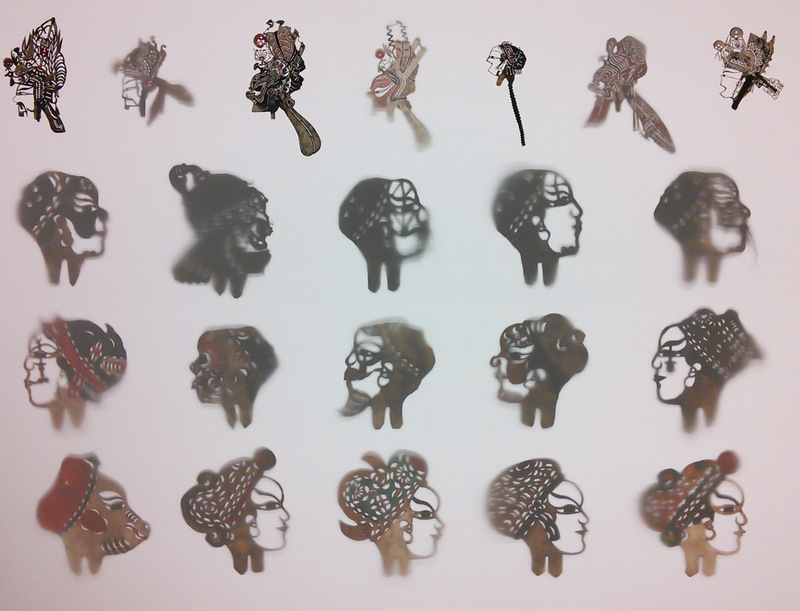 I’m intrigued by the results and starting to think of other ways to combine silkscreen printing and laser cutting, e.g. with pine panels and Douglas Fir blocks. This entry was posted in art and tagged art, laser cutting, silkscreen printing on March 5, 2015 by Bill Horne. Claire in the artist market tent. 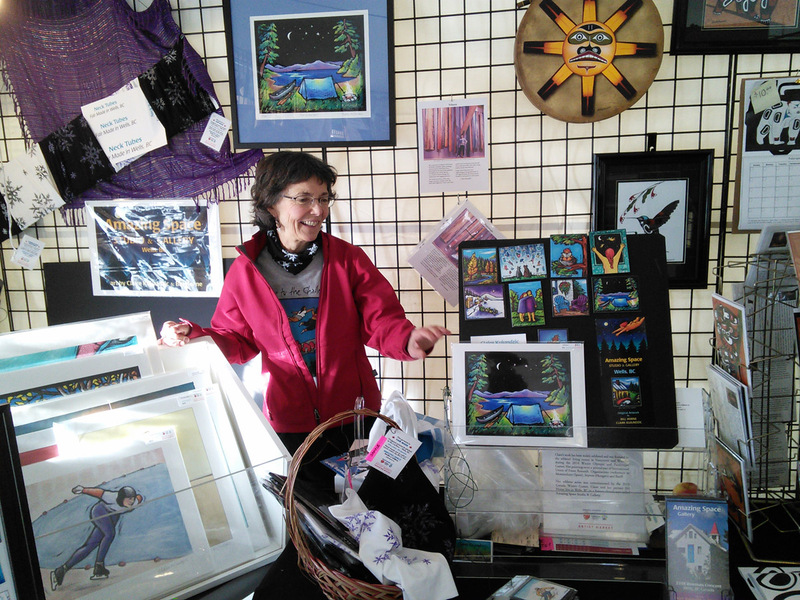 Each piece of artwork and merchandise for Claire’s display in the Artist Market at the Canada Winter Games in Prince George was required to have unique, coded labels. This was to help any volunteers at the checkout keep track of sales. I knew I could generate unique sequences of identifier codes using Excel and print them from a Word label template, but I wanted to include a colour logo and apply styles that might be awkward to achieve in Word. InDesign and QuarkXPress can import Excel spreadsheet data, but I couldn’t find label templates for them. Although Illustrator doesn’t import easily from Excel, it does have label templates and its tools offer lots of precision, so I decided to work with Illustrator and Excel. I started by creating a sequence of unique identifier codes in Excel, by making two numbered cells in a row, selecting them, then grabbing the +sign handle and dragging the selection down to create a numbered sequence as long as I wanted. 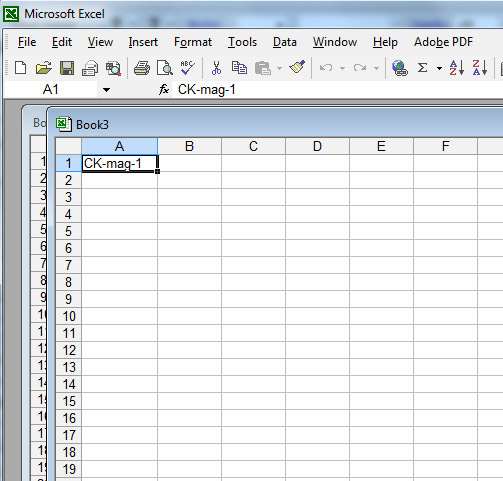 Starting a code sequence in Excel. Second code entry to generate a sequence. After selecting both cells, the cursor will change to a + sign when hovering over the bottom right corner. Pulling the + handle down starts generating a sequence of code numbers. Then I opened a label template (Avery 5167 – 80/sheet) in Adobe Illustrator. 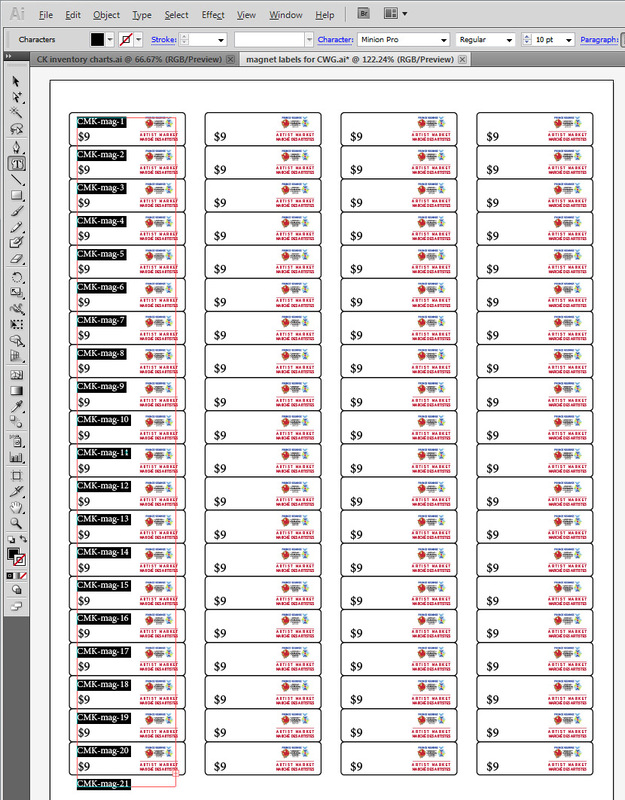 Avery label 5167 template imported into Illustrator: 80 labels/sheet. On a separate layer, I placed the Canada Winter Games logo that we were authorized to use, and the price for Claire’s art magnets we wanted to label and track. I locked these layers so I wouldn’t risk accidentally moving any of those elements, then created a new layer for the codes. Prices and logos placed on each label. Illustrator layers for setting up labels. 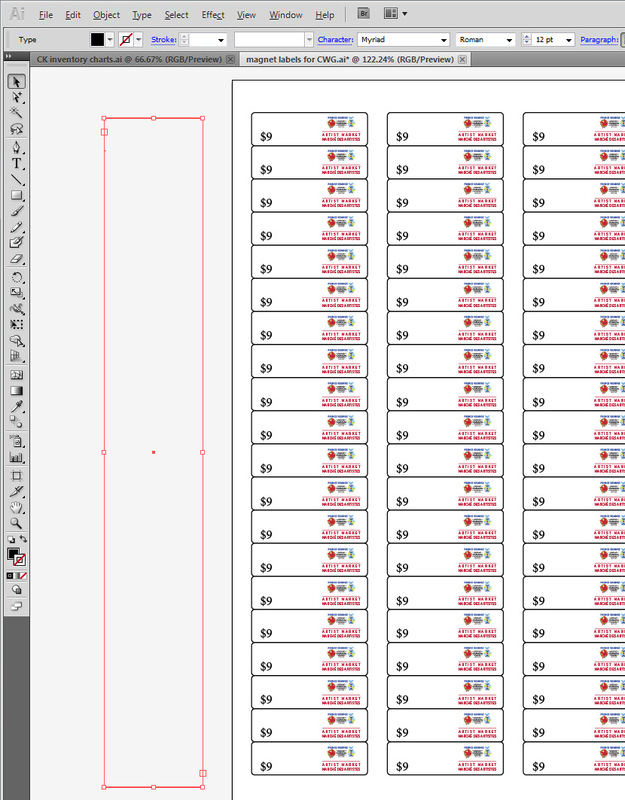 Next step was to create a text container box in Illustrator, then make 3 copies of it. Creating a text box in Illustrator that is roughly the same height as an existing column of labels. Four identical text boxes placed over the label columns. 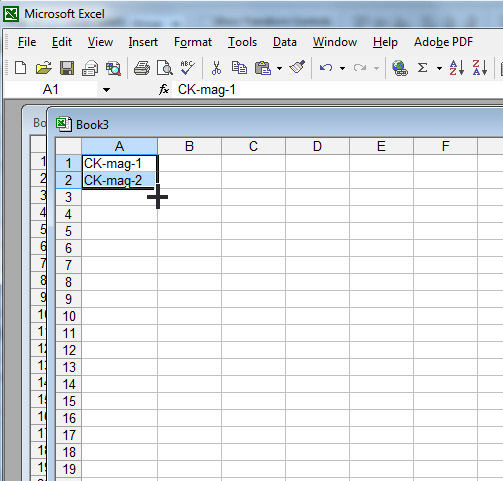 Back in Excel, I selected my column of sequenced code from CMK-mag-1 to CMK-mag-80, clicked Copy, moved to Illustrator, selected the first text box with my Area Type Tool, and Pasted the string of code into the box. 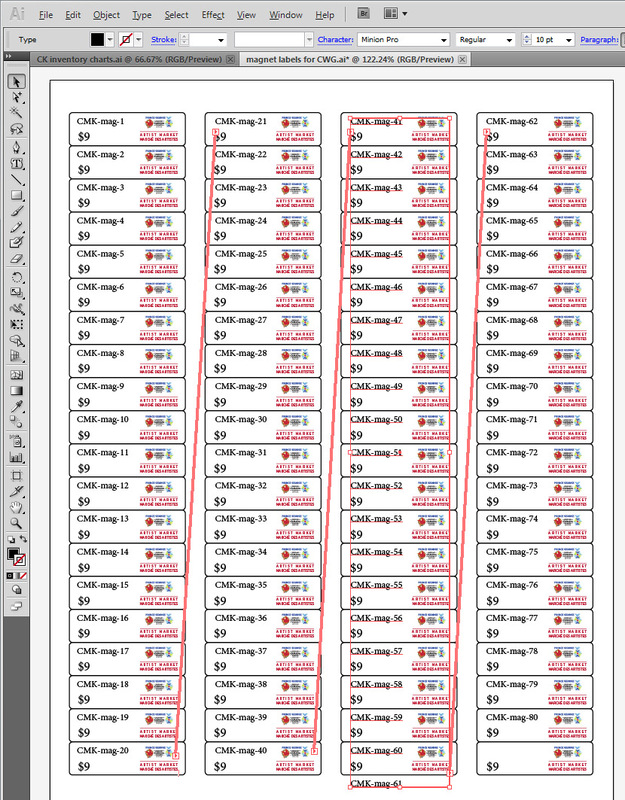 Importing sequential code data into a text box in Illustrator. Of course, I needed to increase the leading so each code would land in the same position on each label. Formatting a column of text in Illustrator to adjust font, leading, colour, etc. Creating threaded text boxes in Illustrator. 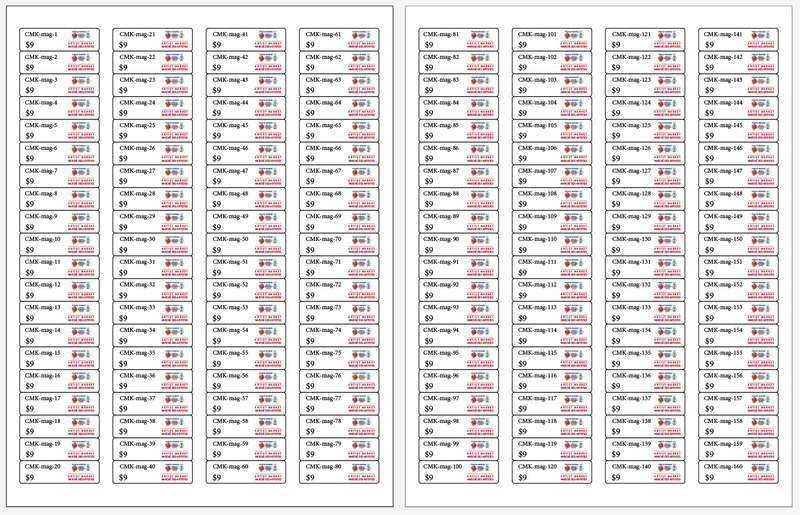 After adjusting the bottoms of a couple of text boxes, all 80 code numbers fit into the same place on their own unique labels. All four text boxes filled and linked with sequential code; the third column needed to be shortened to bump its bottom entry to top of the fourth column. I was ready to print to a Postscript laser printer. There’s probably a way to accomplish this in Word, but this was a lot easier. Having built the file in layers, I am able to quickly build variations with additional Illustrator Pasteboards. 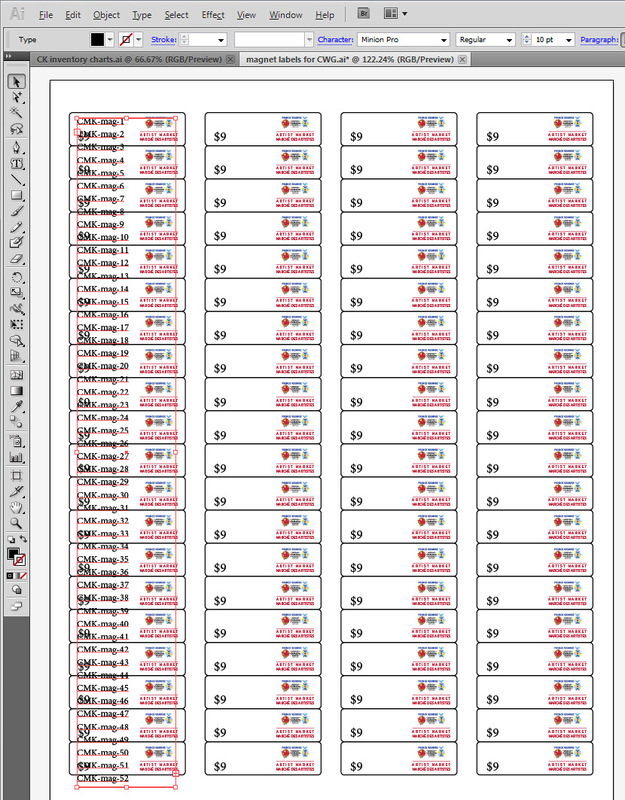 And it was easy to select codes and prices to create master inventory sheets in Illustrator for the checkout. 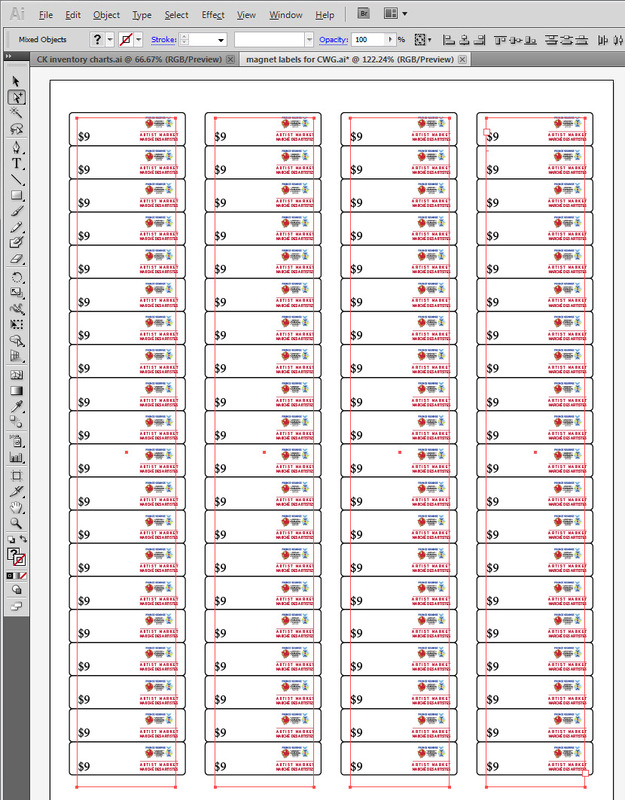 A second pasteboard added to the Illustrator file, then filled with a continuing sequence of codes. 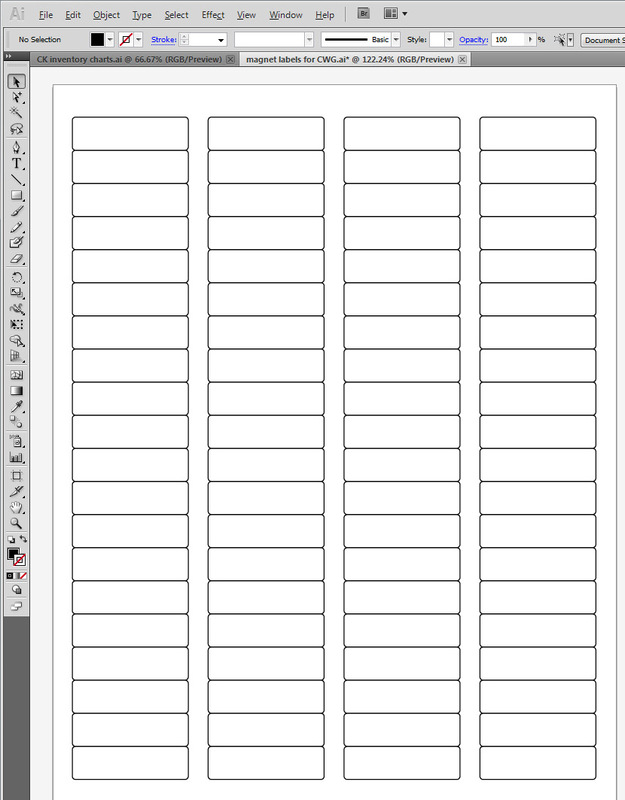 I now realize that I could also create custom, graphic-rich labels in InDesign and QuarkXPress by saving an Illustrator label template as a PDF, importing it into ID or Quark, then designing my labels on a separate layer above. 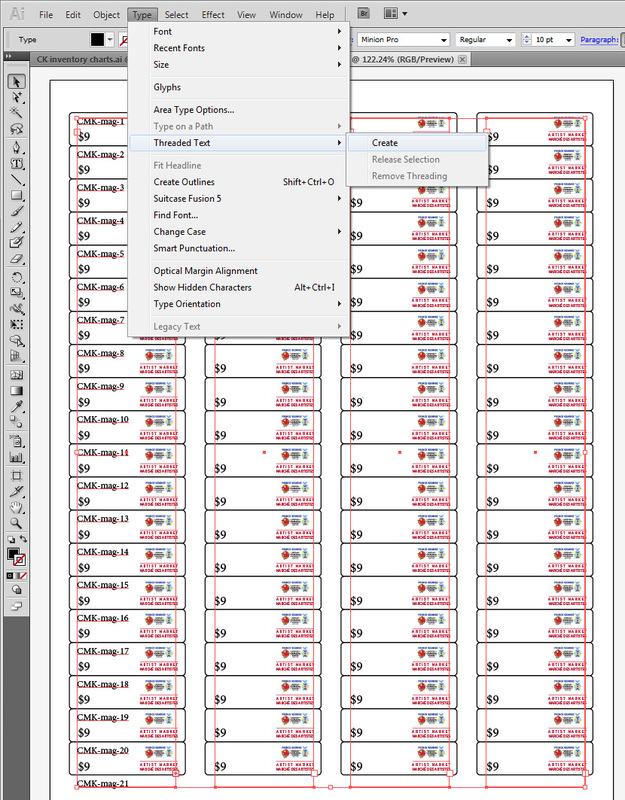 A key challenge is to have the printer deposit its ink or toner exactly within the label perimeters, not overlapping the edges, and this process should offer the same precision as my Illustrator-Excel workflow. This entry was posted in art, Uncategorized and tagged Adobe Illustrator, art fairs, Excel, labels on February 21, 2015 by Bill Horne. 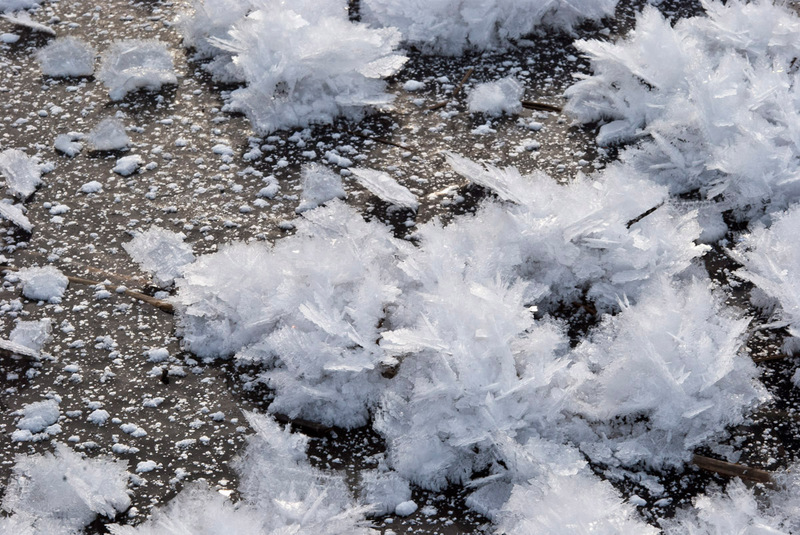 Extreme cold draws moisture out of the air until it sparkles with minute ice crystals. 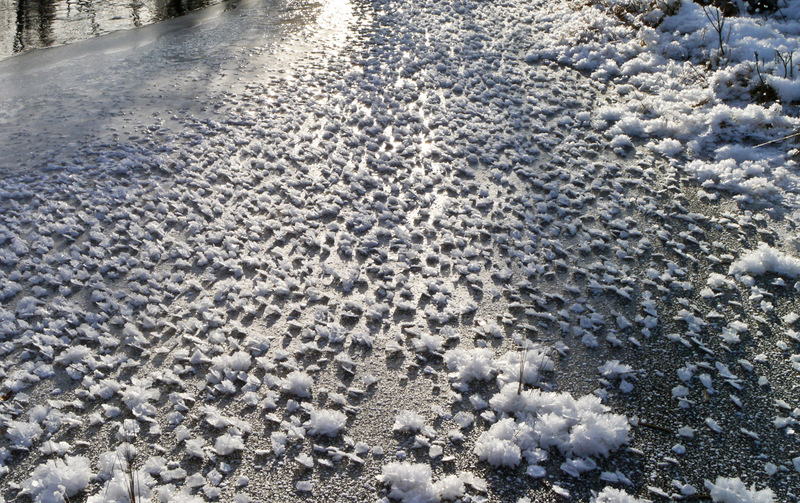 Underfoot, snow crunches like styrofoam. 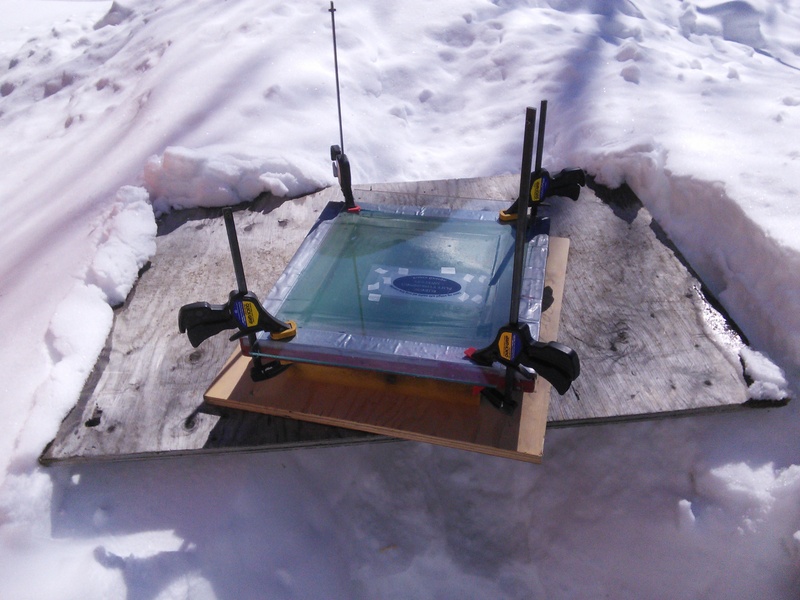 The cold acoustics seem to carry sound farther, even though deep snow muffles it. Snow begins to cover everything, then hoar frost starts growing new shapes and textures, different each day due to wind, sun, snowfall and temperatures. Willow winter cotton bolls – made of fresh snow. Crystal blossoms on creek, fall 2014, Wells. Palm-sized crystal blossoms on creek, fall 2014, Wells. 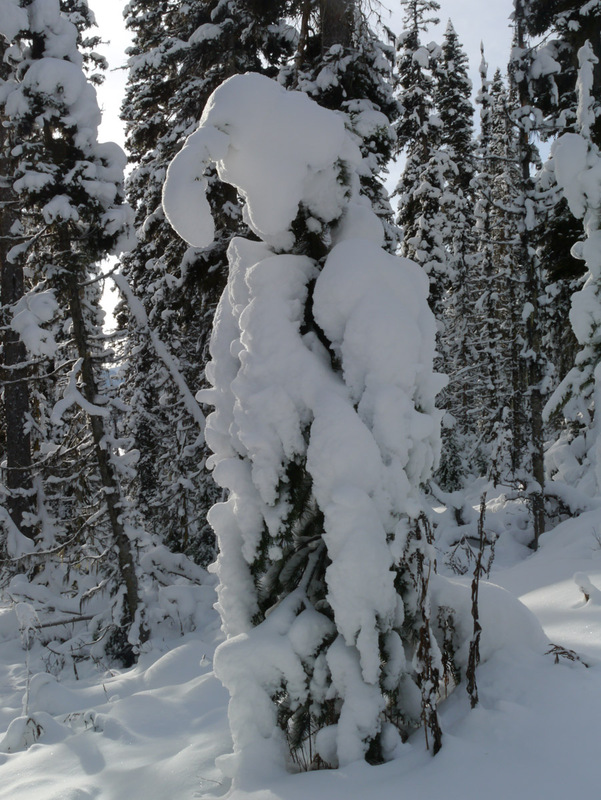 Puppet tree – dressed in fresh snow. I find it difficult to leave these scenes, especially knowing many fragile forms may be gone the next time I return. Slide Mountain alpenglow, fall 2014. Eventually the cold temperatures send me home to defrost my fingers. 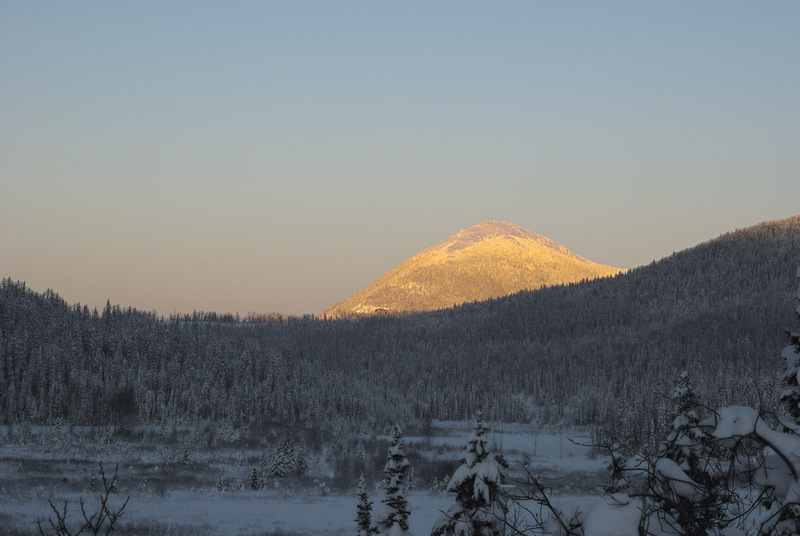 Setting sunlight on Slide Mountain warms my eyes along the way. This entry was posted in art, Nature, Uncategorized and tagged acoustics, alpenglow, crystals, snow, Winter on December 23, 2014 by Bill Horne. 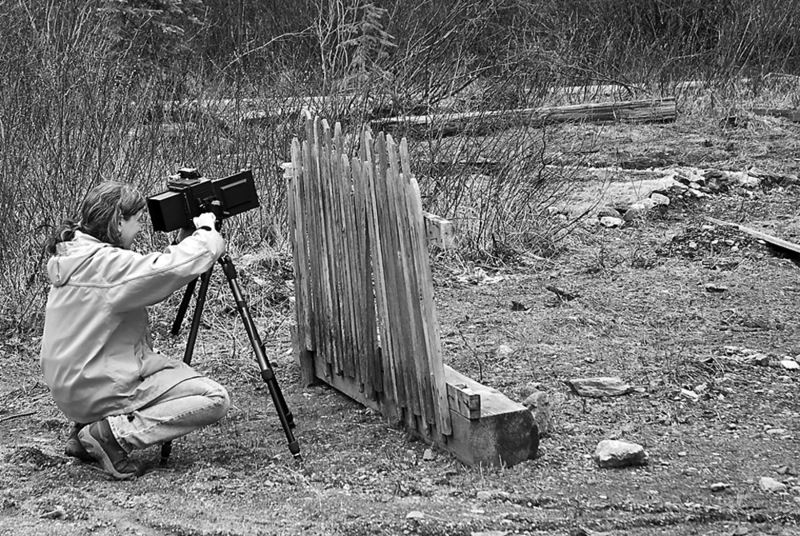 Kathy Kinakin making large format photographs, Stanley, BC, 2008. I first met Kathy Kinakin when she walked into our gallery about seven years ago with a Brownie camera in a leather case. It didn’t take long for our conversation about photography to cement a friendship we have enjoyed since that day. Kathy works at Beau Photo in Vancouver, BC, one of the best camera stores anywhere, and knows a lot about a very wide range of photographic techniques, as well as professional gear. 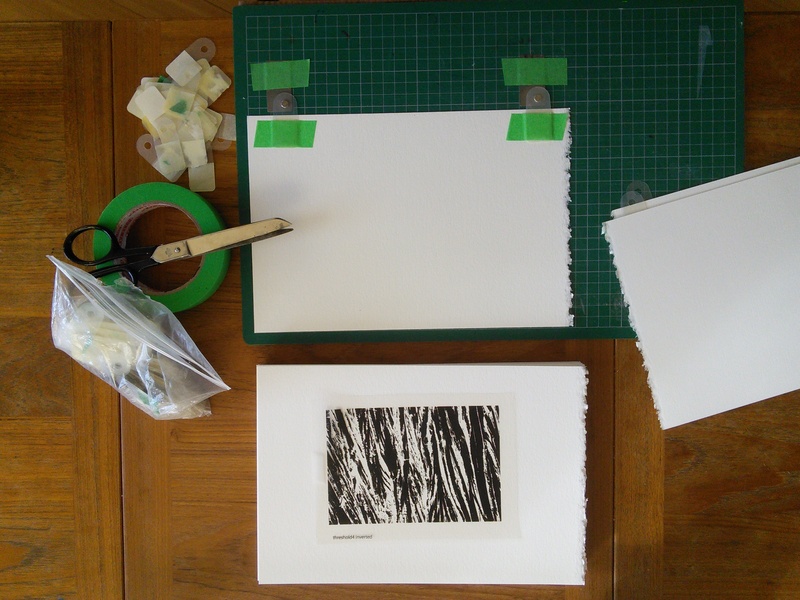 Here she is demonstrating an emulsion lift with impossible project film – very cool! 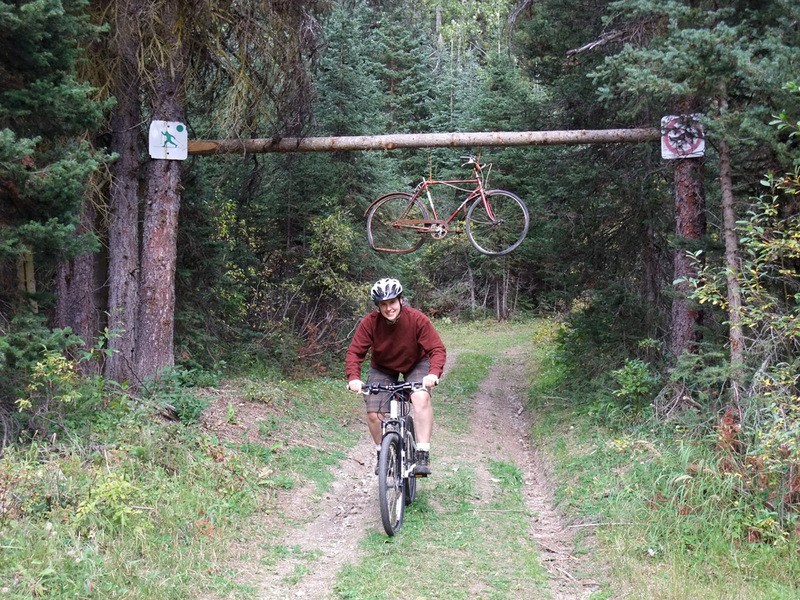 Kathy riding back to Wells from the Valley Mountain trail. 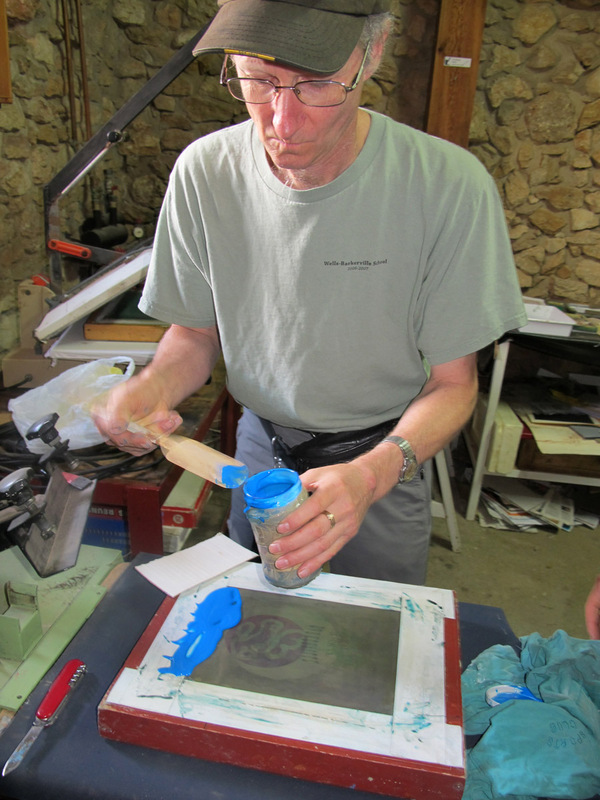 In August, Kathy offered a workshop on historic photographic processes at Amazing Space here in Wells. I was late getting the word out, and those who had wanted to attend could not get off work, so there was just me and Kathy – lucky me! 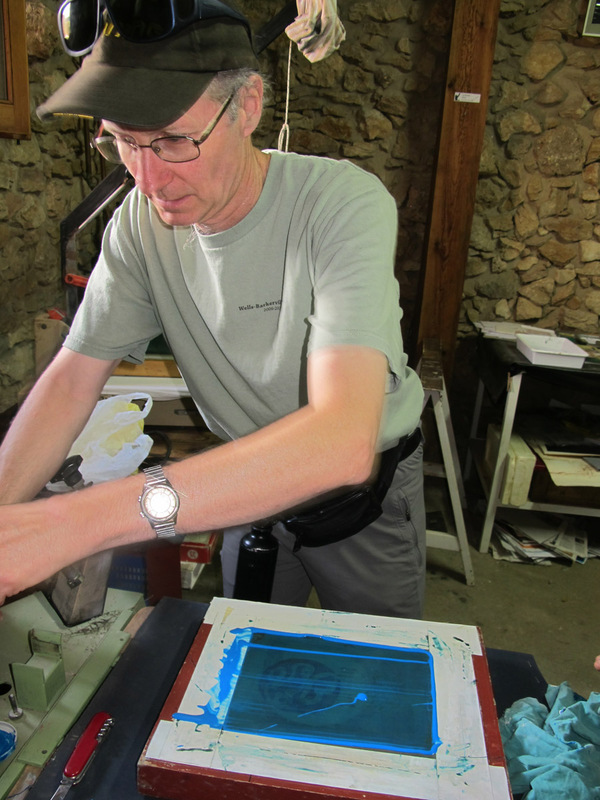 I’ve used low tech, less toxic screen printing methods for many years, such as sunlight photostencil exposures. The sun is the ultimate point light source and works even in the winter; it just takes longer to “burn” the stencil image, e.g. 40 minutes in January. Sunlight silkscreen photostencil exposure, Wells, March, 2014. 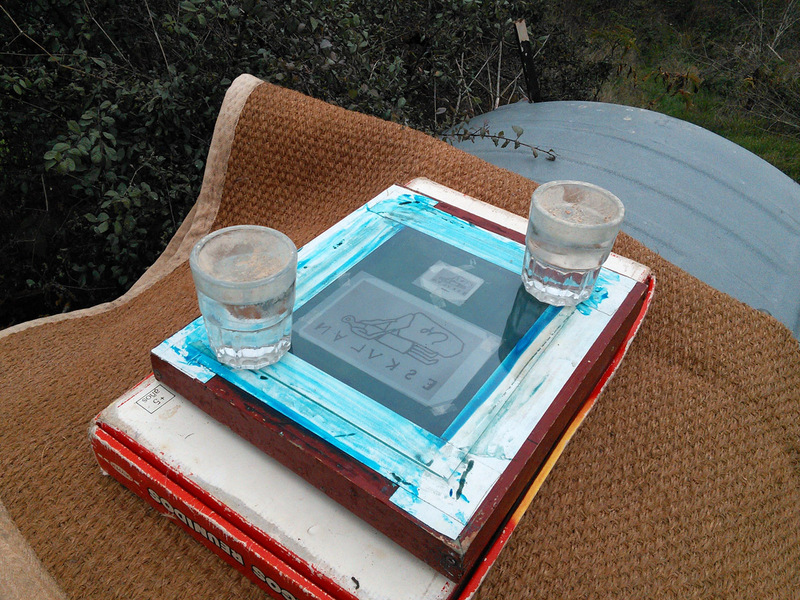 Glass clamped on top of film positive, sensitized screen, foam, & a plywood board. 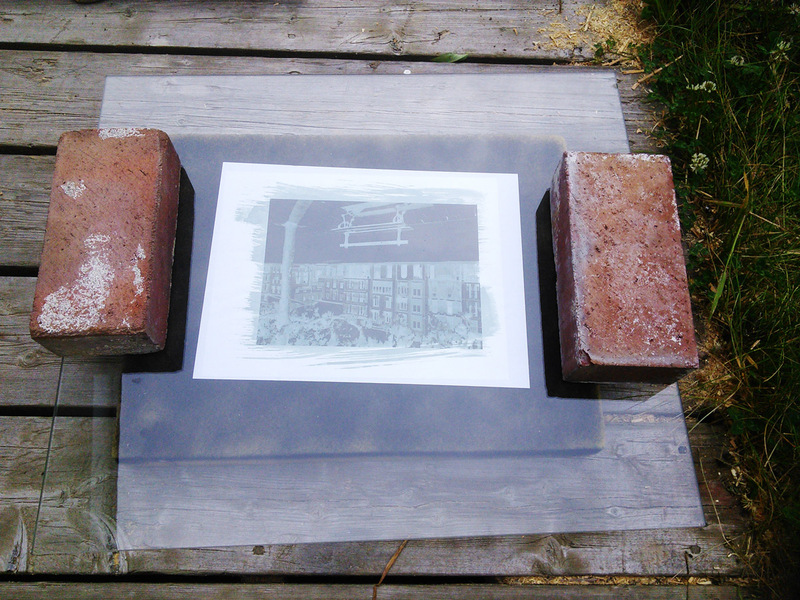 As a result, I was interested to see how Kathy would also use sunlight to expose cyanotypes and Van Dyke images. 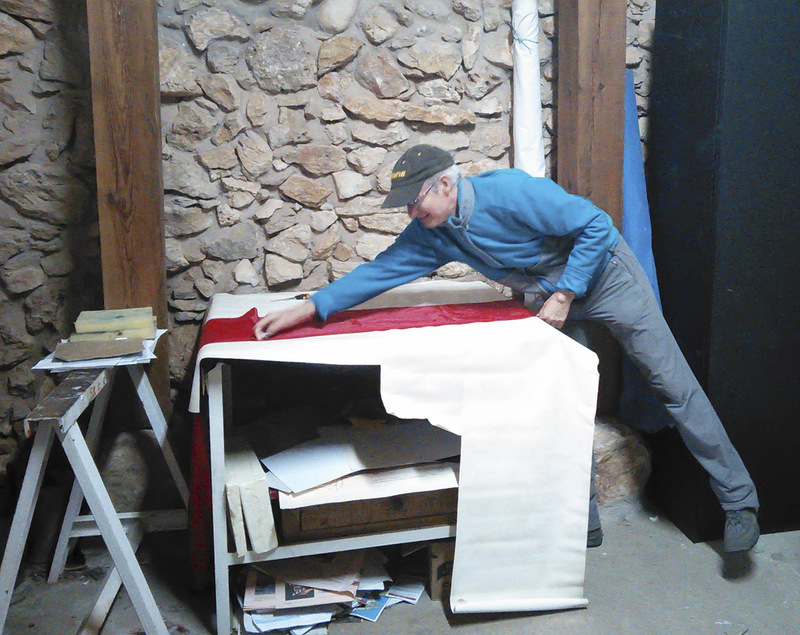 Her first step was to coat several sheets of paper with those compounds, then let them dry; all done in a dark place. When ready, we used my screen setup, except this time there was just paper and a reversed film negative under the glass, snugged flush to the paper supported by foam. And we used bricks instead of a clamp to weight the glass. 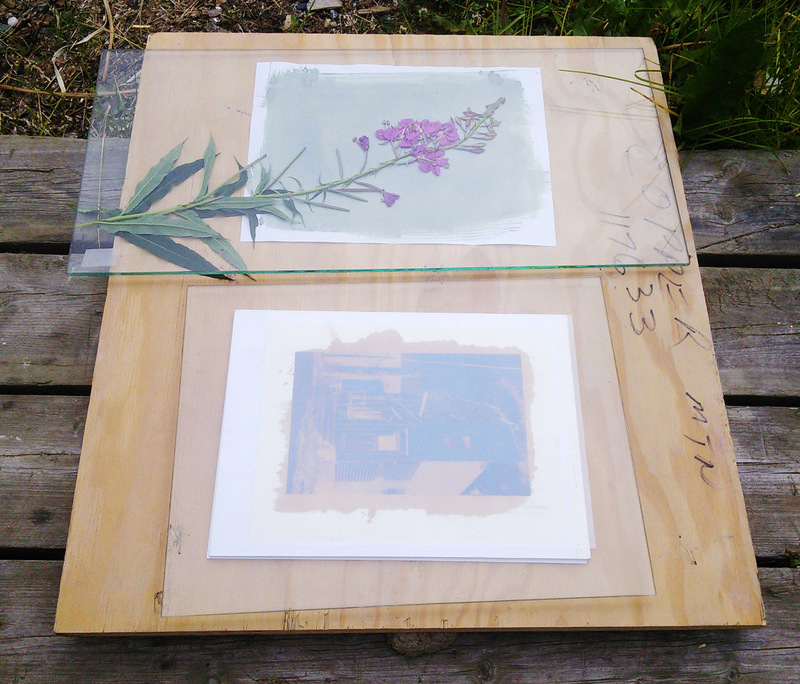 Exposing a cyanotype photogram with fireweed and a Van Dyke image with a film negative, both in sunlight. 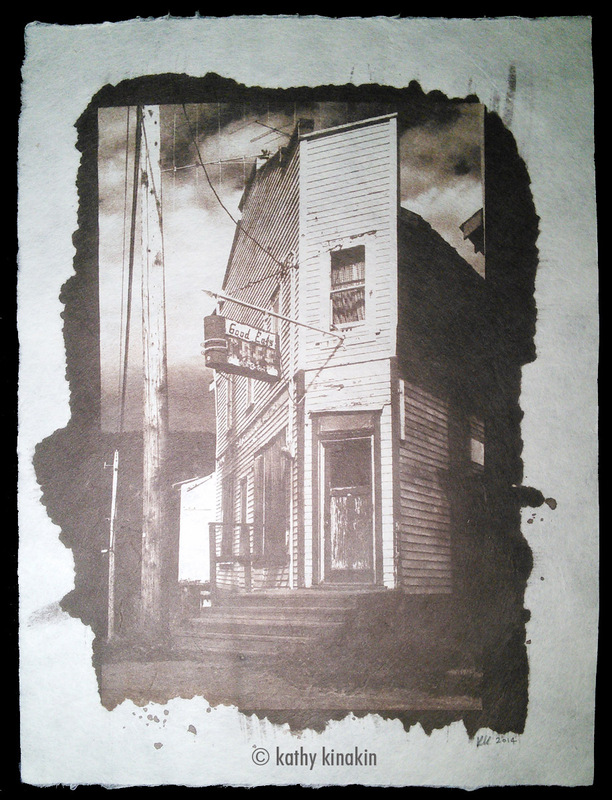 Good Eats, Van Dyke print © Kathy Kinakin. 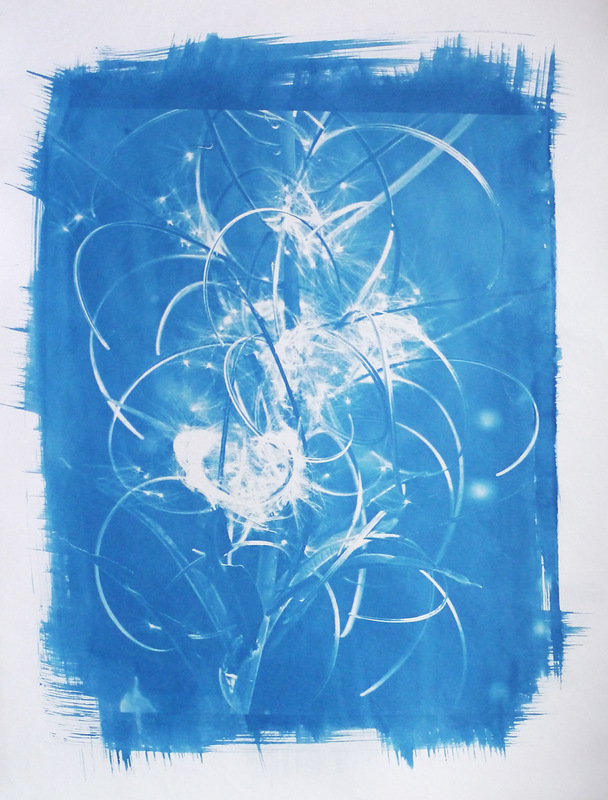 Wildflower photogram, Van Dkye print © Kathy Kinakin. 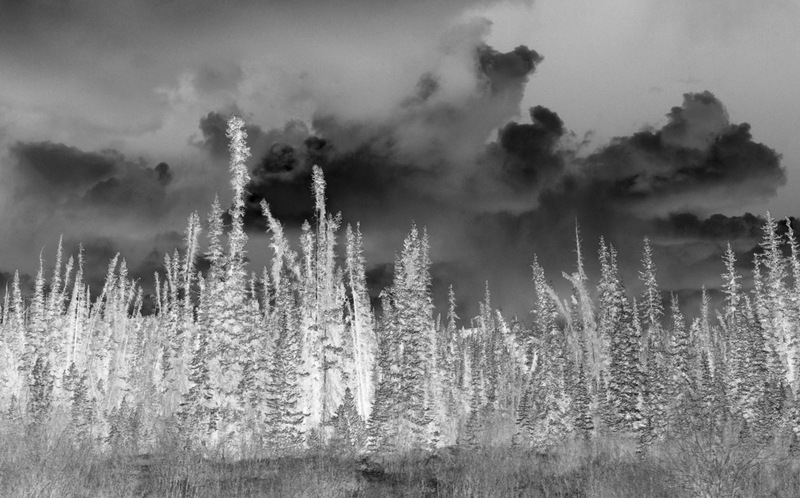 Photograph of swamp spruce, converted to greyscale from RGB using adjustment layers, reversed, and flattened. 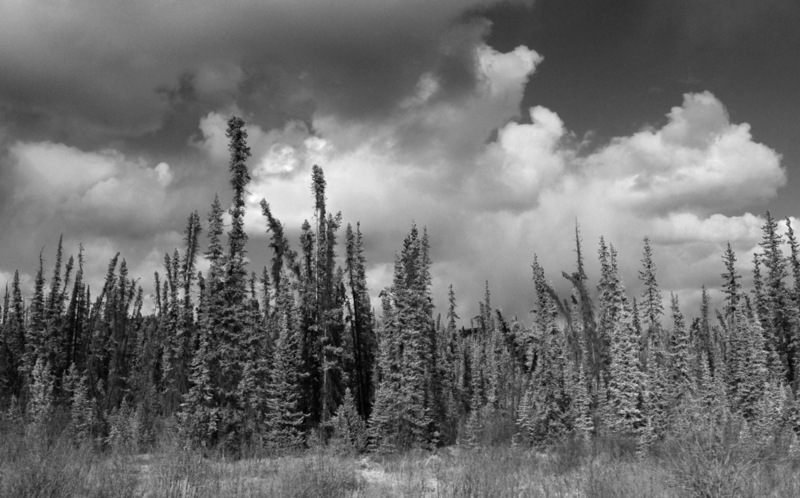 Swamp spruce film negative image. 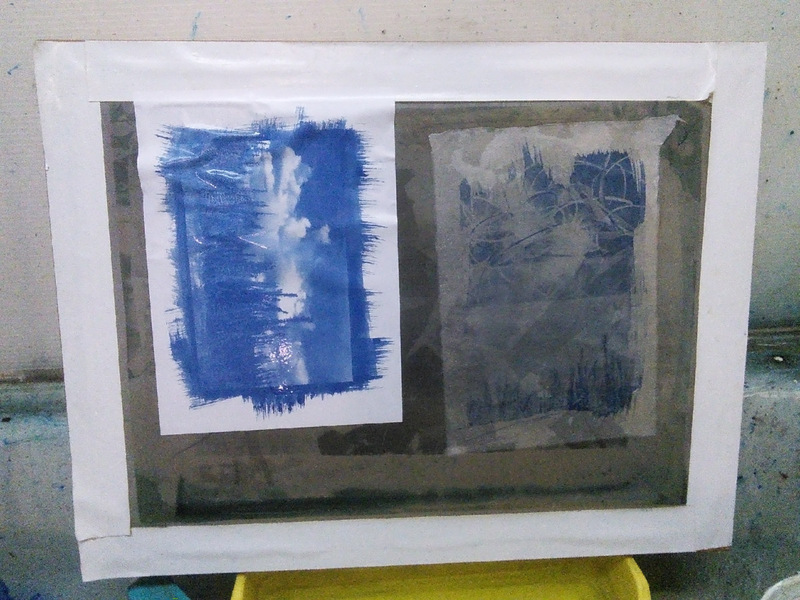 Rinsing two cyanotypes on a silkscreen for support; the buckled paper flattened perfectly after drying by placing in a heat transfer press for 15 seconds. 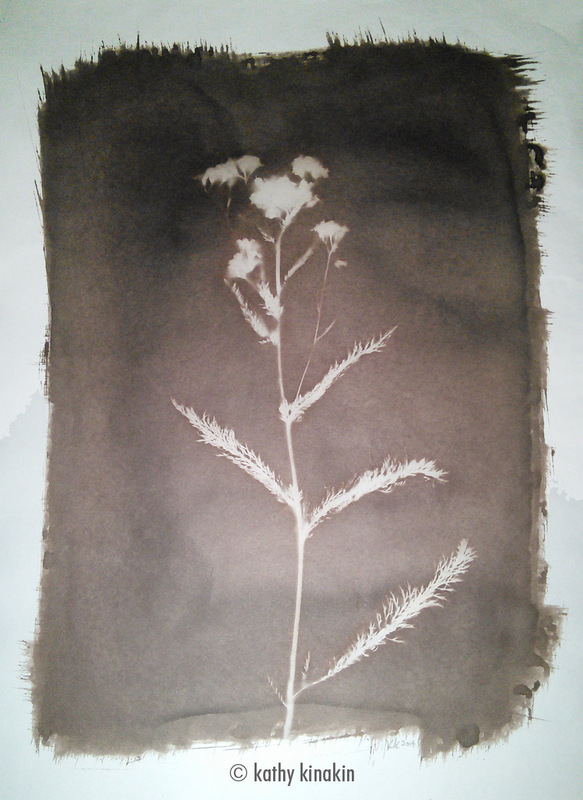 Fireweed cyanotype © Bill Horne, dried and flattened. I learned a lot from Kathy and it was a pleasure to have her visit. 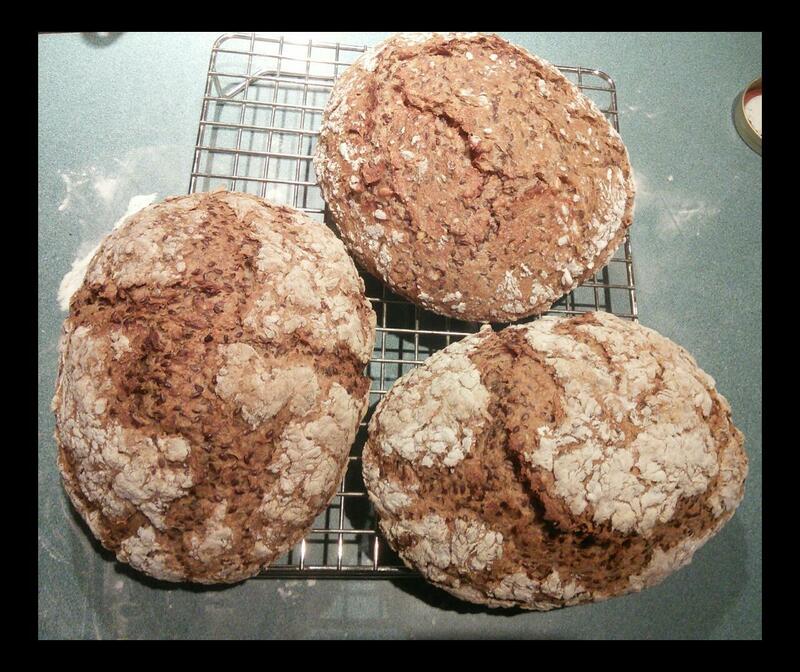 She even helped grind wheat for Claire’s home made bread, and split a massive pile of firewood! Thanks so much! Kathy wields the splitting maul. 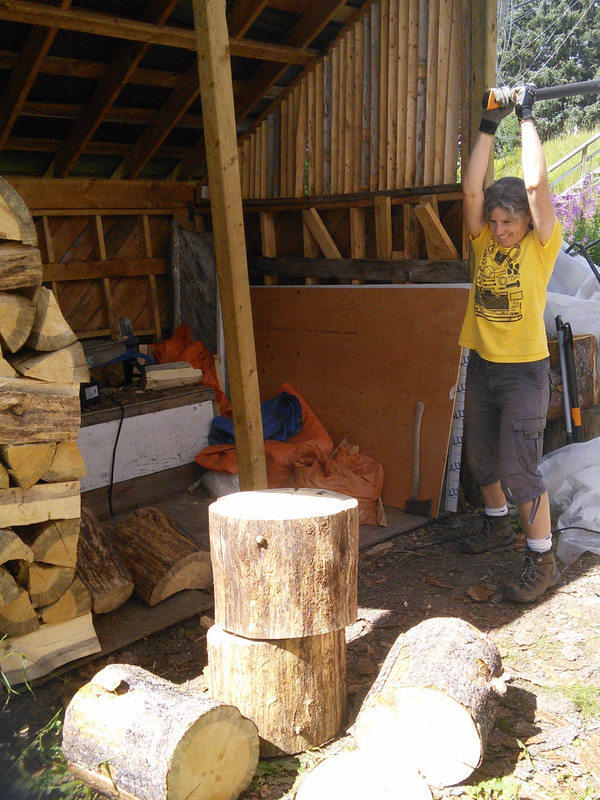 One whack split this round of dead pine! 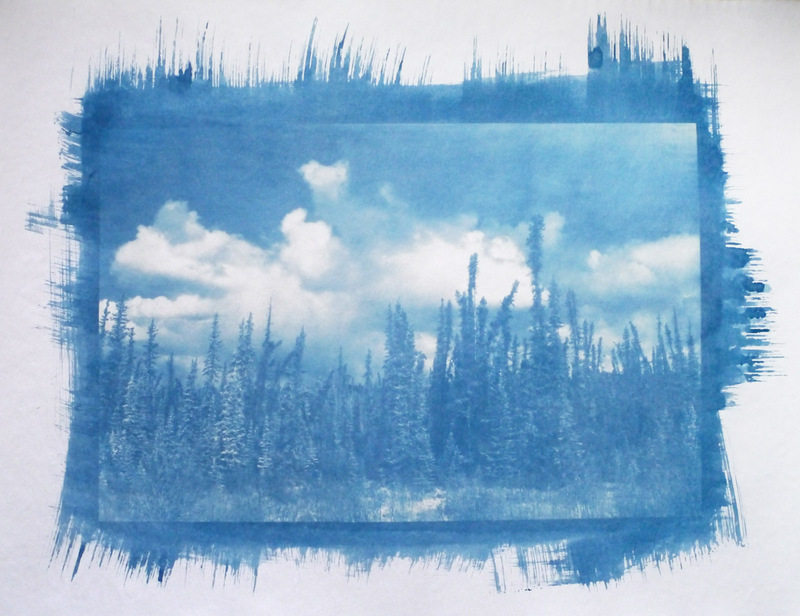 This entry was posted in art and tagged art, cyanotype, Kathy Kinakin, photography, Van Dyke on November 27, 2014 by Bill Horne. It’s worth visiting Tolosa just to visit the TOPIC puppet museum which houses an amazing collection from around the world, but plan on spending at least half a day in there. An animated puppet will greet you in one of several languages as you enter a labyrinth of displays, projections and exhibitions. 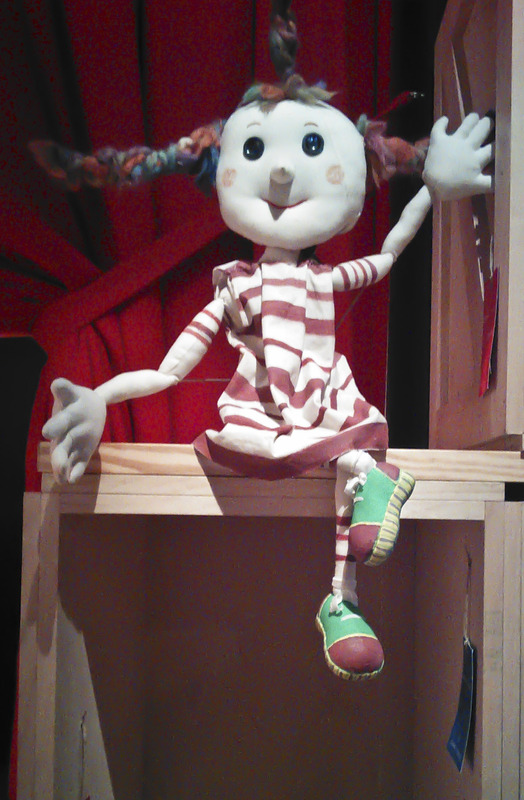 The mascot puppet at TOPIC beckons visitors into the museum & explains what awaits us inside. One of my favourites sections is a long corridor of shadow puppets; the 1955 film by Jean Painleve of the US sculptor Alexander Calder performing his “Circus” is enchanting, too. The poster collection is outstanding. Part of the shadow puppet corridor. 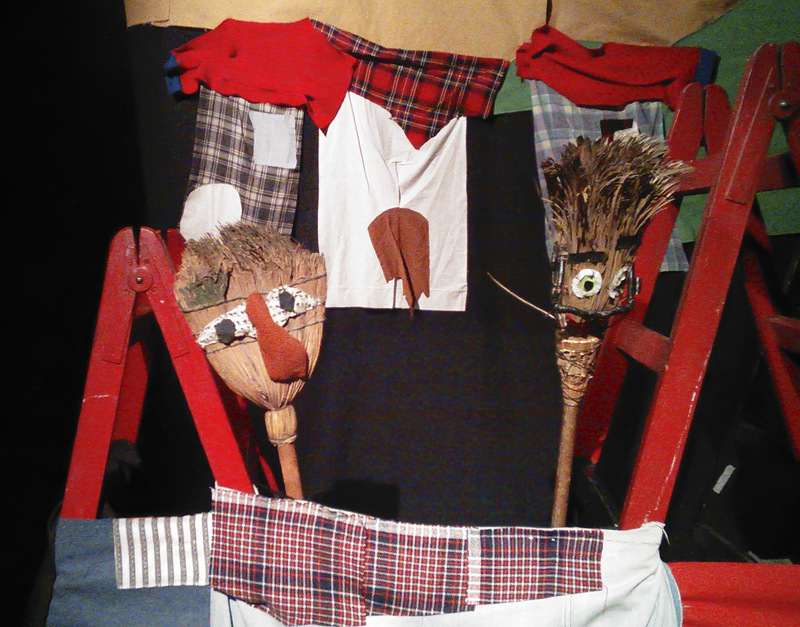 Puppet wearing a Basque txapuela at TOPIC. Low tech puppets at TOPIC. 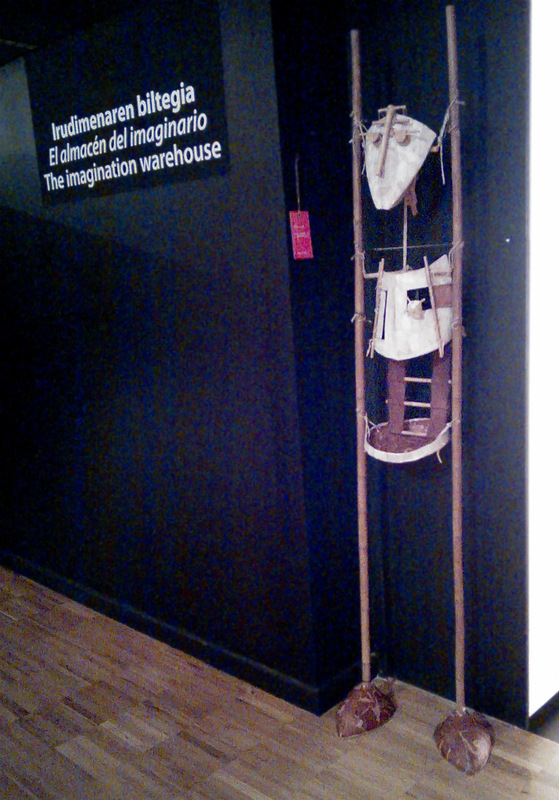 The temporary exhibition I saw displayed work by Enkarni Genua & Manolo Gomez of Txotxongillo Taldea who have worked in puppetry and theatre since 1971. TOPIC also organizes occasional workshops and has an online archive of posters, festivals, books, etc. 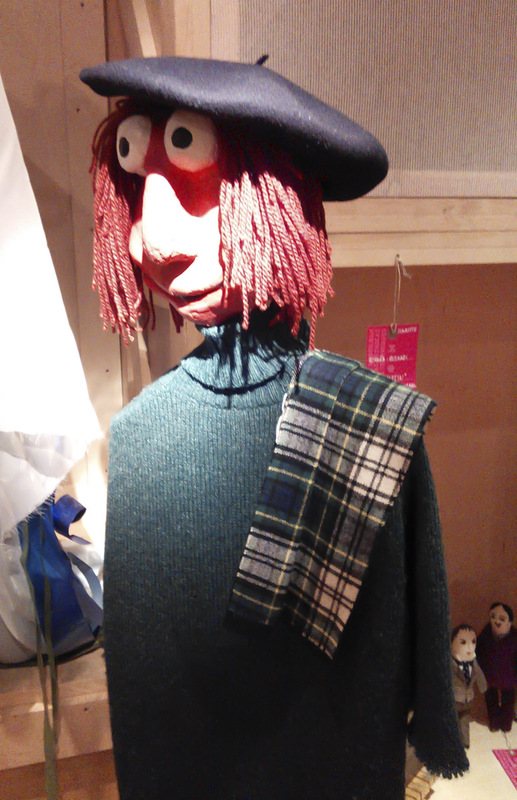 Another inspiring display at TOPIC puppet museum. 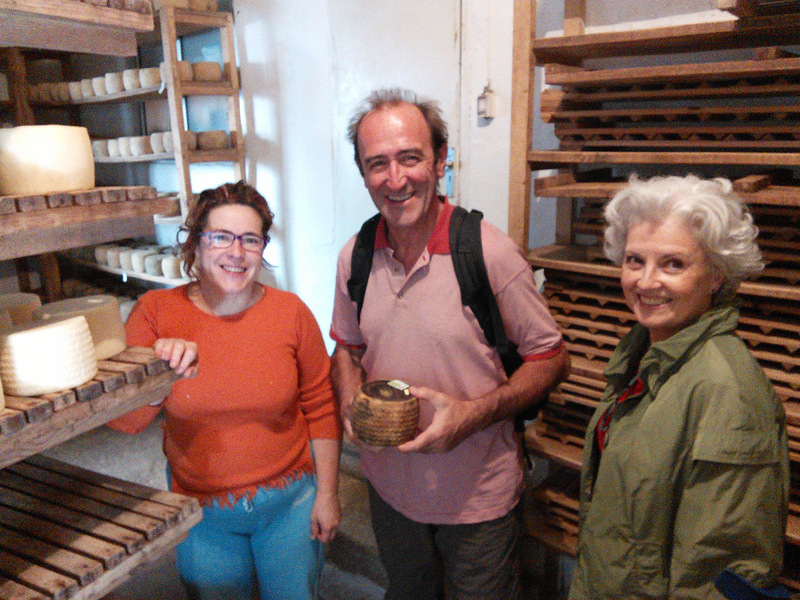 My papermaking apprenticeship had ended, and I planned to take the RENFE and Euskotren trains back to Donostia and Bilbao, then a bus to Oña where Dorien Jongsma from El Hacedor could meet me. There were no buses running to Oña that Saturday, though, because it was Columbus Day (! ), so I had to wait another day to make this trip. 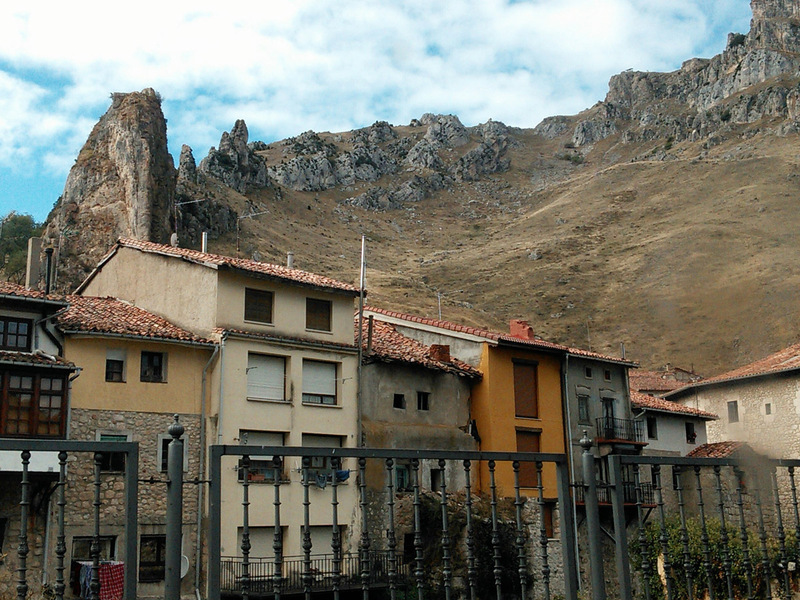 This meant I’d have less time at El Hacedor, but the bonus was a last chance to walk around Tolosa, Hernialde, Anoeta and Billabona with a camera. Billabona plaza, near Paperlan fibre/paper warehouse, public library & police station. 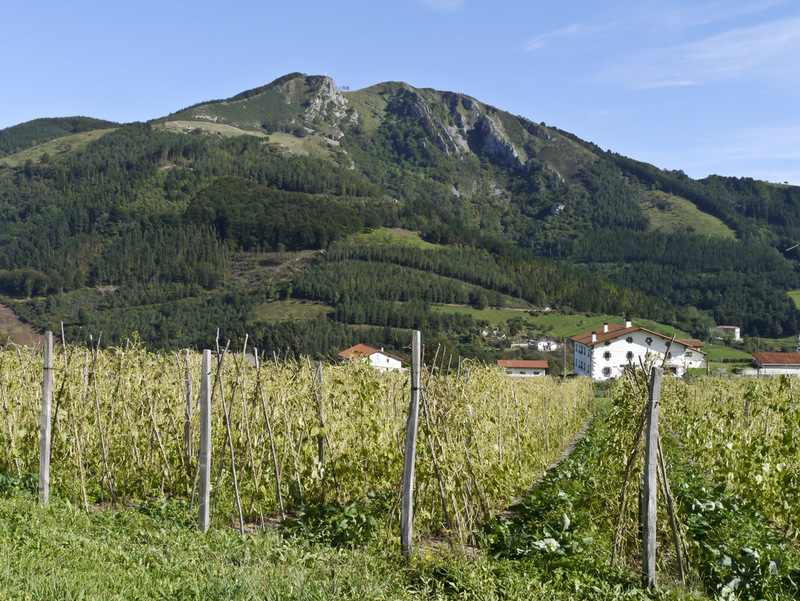 A view from Hernialde towards Mt Uzturre above the north end of Tolosa; black bean field in the foreground. 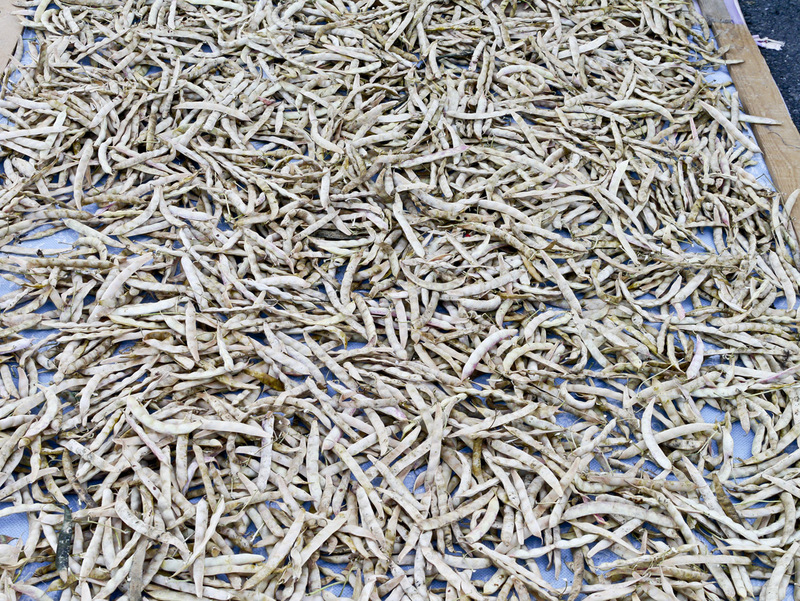 Freshly harvested black beans drying in a driveway; Hernialde. 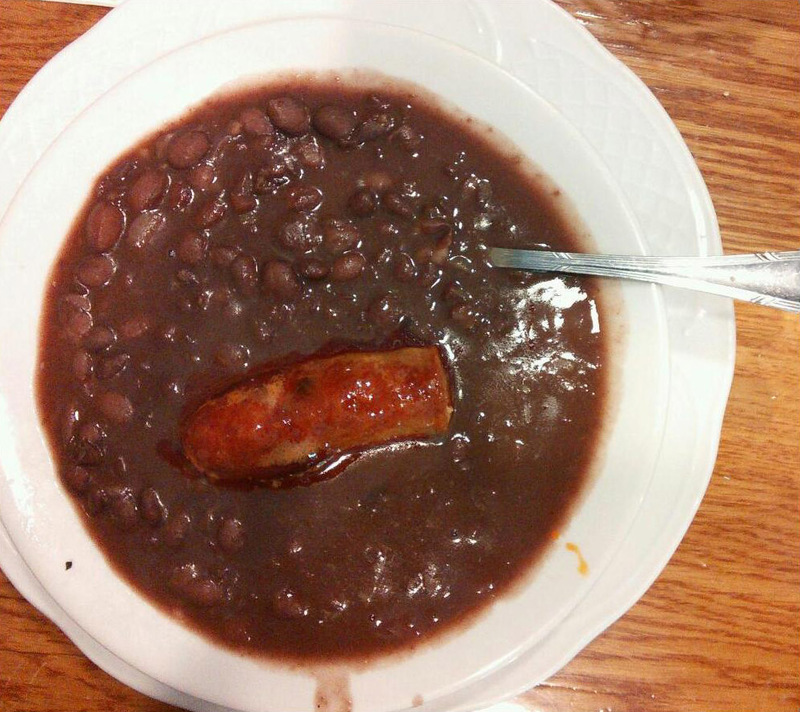 Alubias con chorizo – a traditional Tolosa black bean dish. Plus I received a supper invitation at Boxa Arte Elkarte studios with Garikoitz and Xabi! 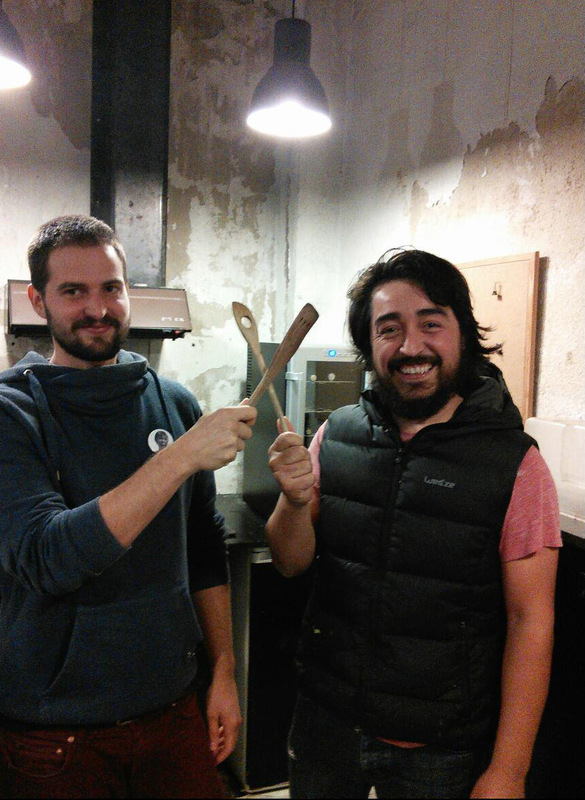 The amazing Xabi & Garikoitz in the kitchen at Boxa Arte Elkarte studios. They thought I was a bit crazy taking trains instead of buses, which are faster, but coming from a country where successive governments have hollowed out or privatized train travel, I enjoy them. And then the little bus on a windy highway makes for a pleasant contrast. 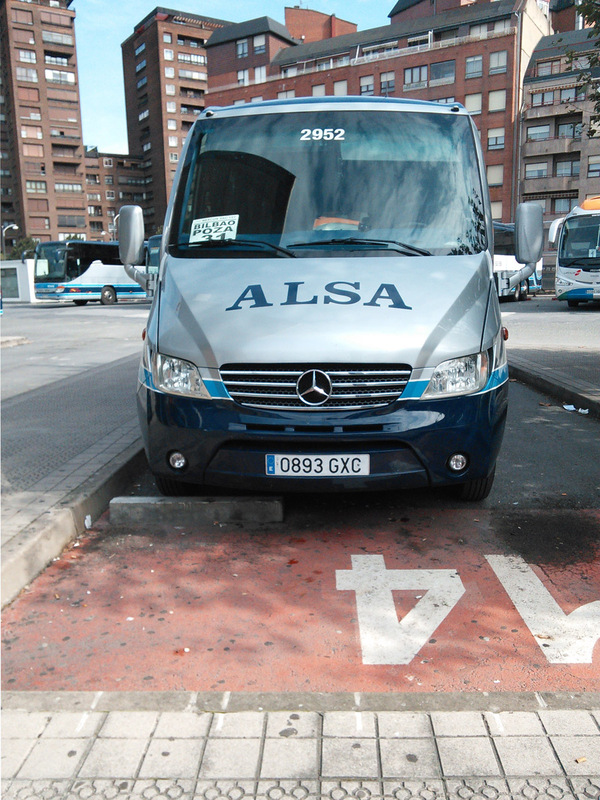 The Bilbao-Poza de la Sal bus waiting at Termibus, Bilbao. 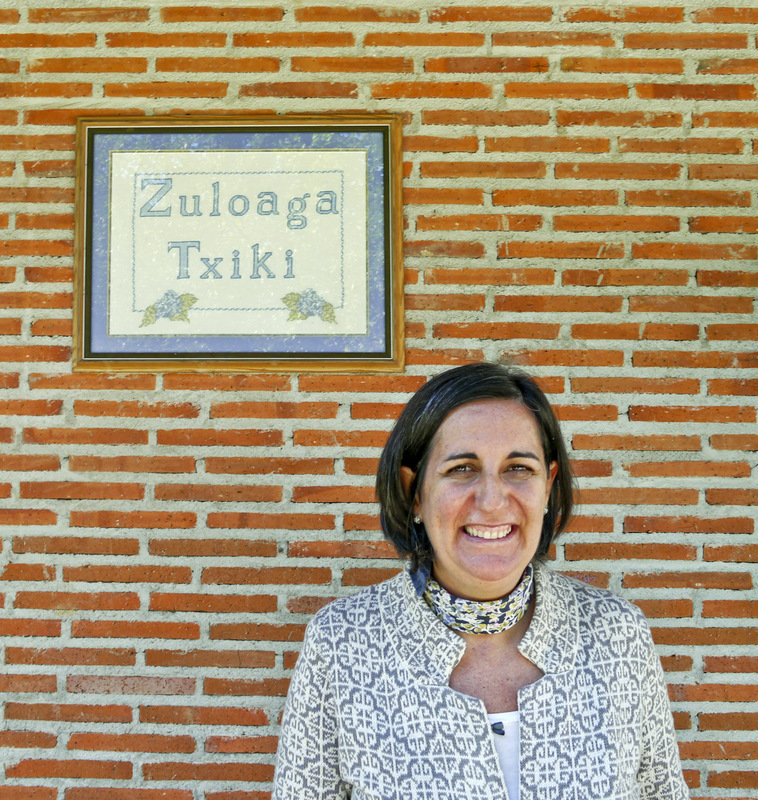 I was sad to leave Zuloaga Txiki, though, where Carmen, Iñaki and José had made me feel so much at home. José & Iñaki joking around in the kitchen at Zuloaga Txiki. 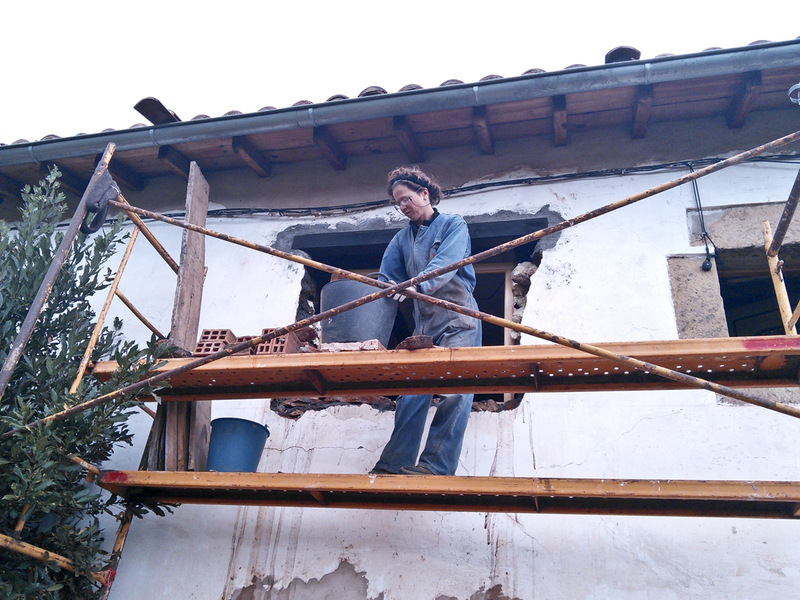 There’s always something to work on at El Hacedor – Imágenes y Palabras in La Aldea del Portillo de Busto, and watching Dorien install a new set of windows in her house was inspiring. I’ll never complain about renovating with old Douglas Fir again: it may be hard to hammer nails into without pre-drilling, but it’s not stone! Dorien hard at work on her new windows. 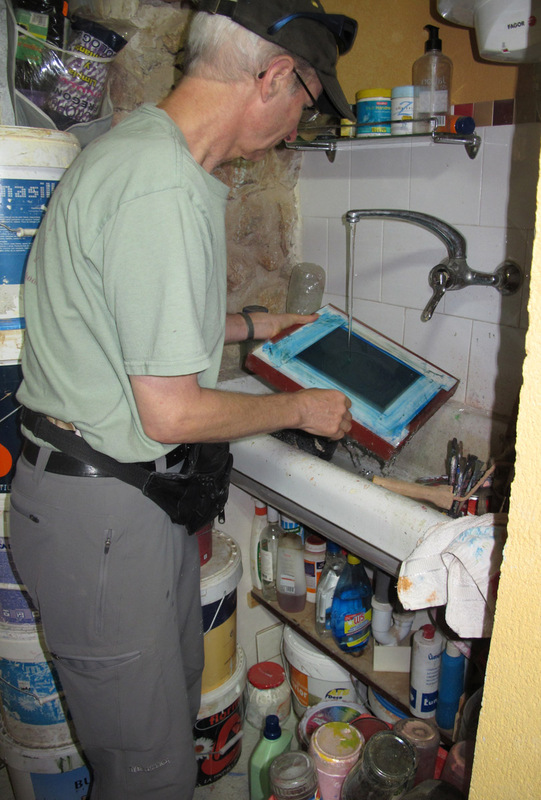 I had brought a silkscreen from Wells with two different sized photostencils of the El Hacedor logo, but what should we print? 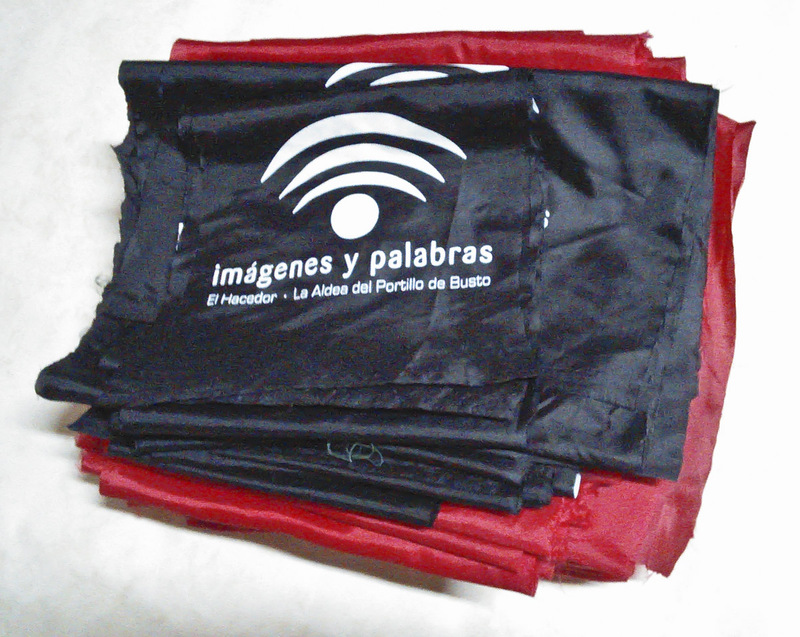 After considering various possibilities, we settled on printing the logo at both ends of fabric “scarves” that could be used for a number of activities. Since Dorien has a couple of burros that live in a lovely corral just down the road, we could easily envision a kind of Dadaist chorus of the Burros of Burgos! 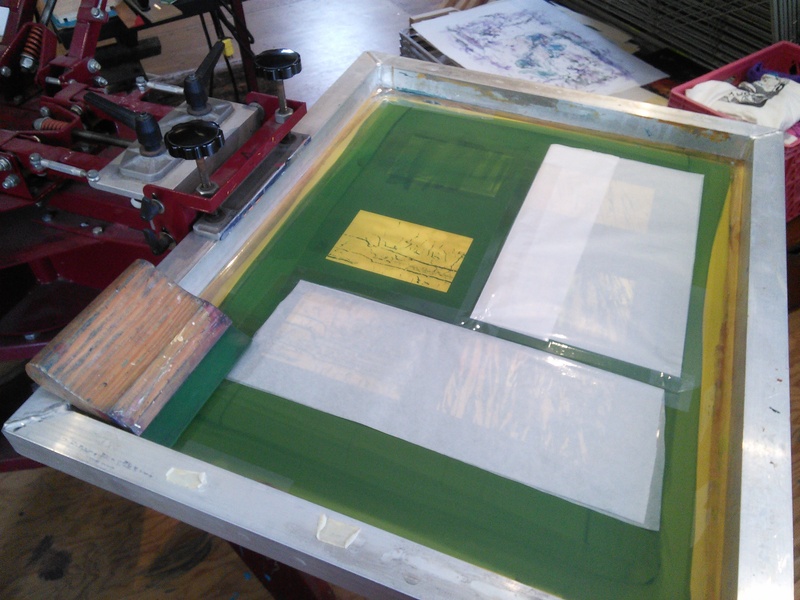 Preparing scarf fabrics to print. 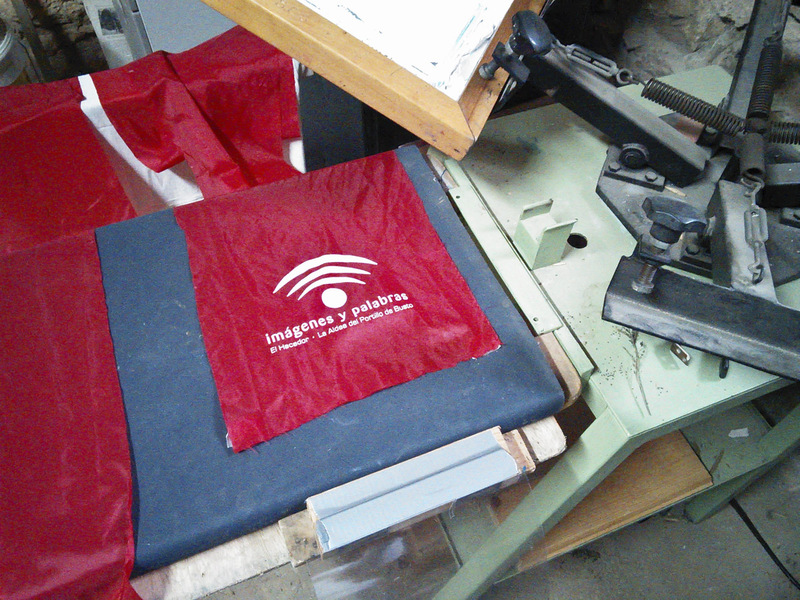 Printing scarves on the t-shirt press. 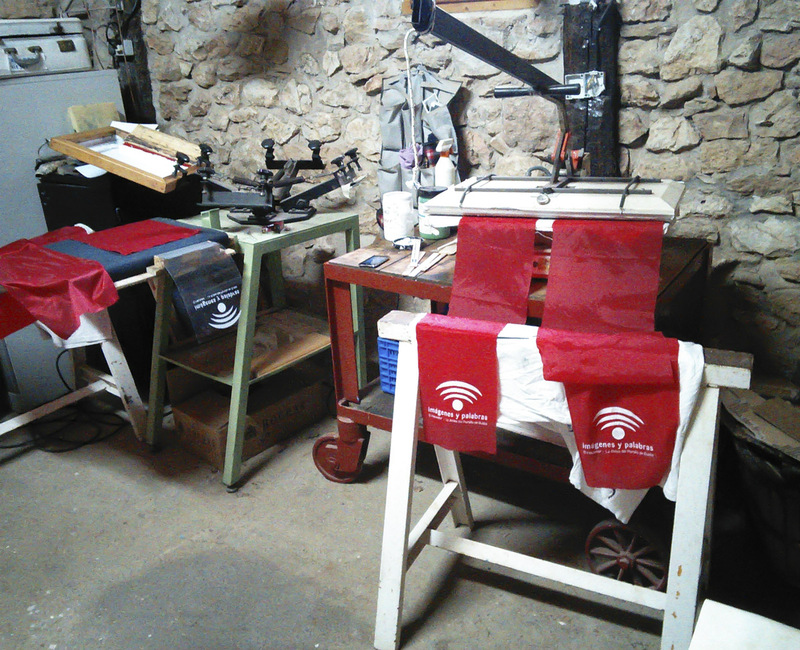 Heat setting two scarves at once while printing the next ones. One of the finished piles of scarves. My pending return flight to Canada had a departure time of 0655 hours, so I needed to be in Bilbao the night before. There are very few transit options from Oña, let alone from La Aldea, and Emilio kindly arranged for a rideshare for me via BlablaCar. 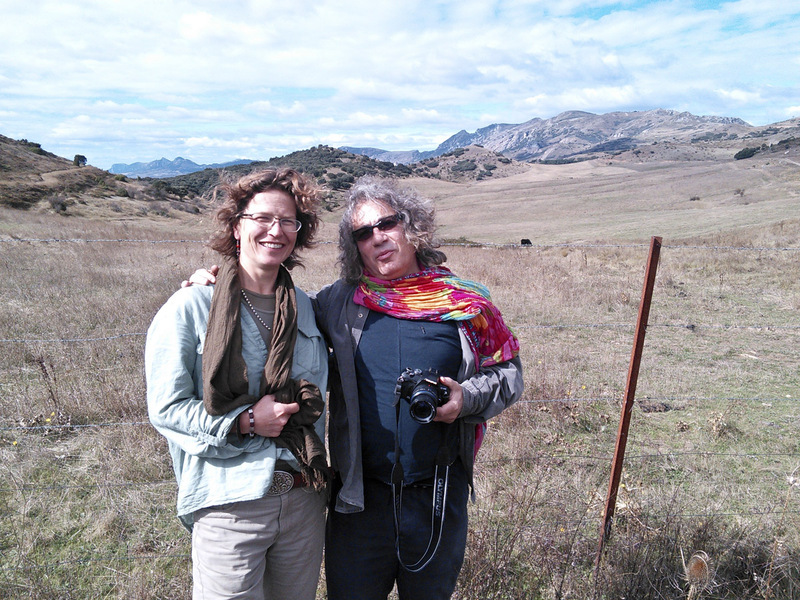 Dorien & Emilio in the hills above Pancorbo. After a quick detour to Miranda de Ebro (sadly, not enough time to visit my friends Eduardo Alvarado & Cristina Montoya & their family) to check on the new windows, Dorien and Emilio dropped me off in Pancorbo where I loaded my gear into the car of a national police officer (I figured this ought to be a safe ride! 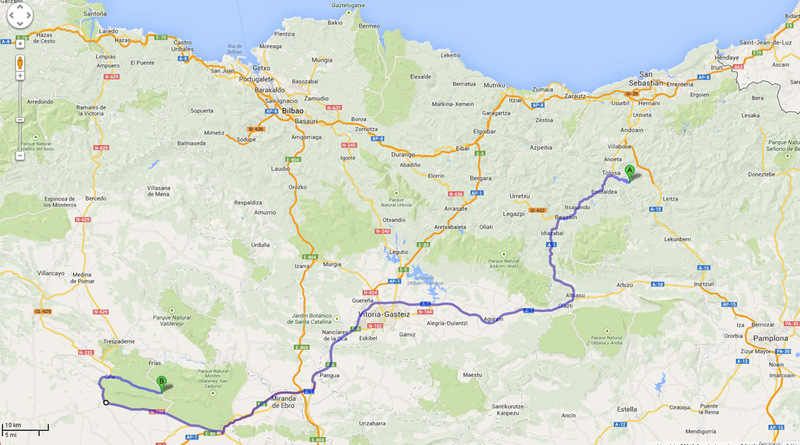 ), who kindly dropped me at a Bilbao metro station and only asked for four Euros towards gas. Another generous person in this country that’s experiencing such acute economic challenges. 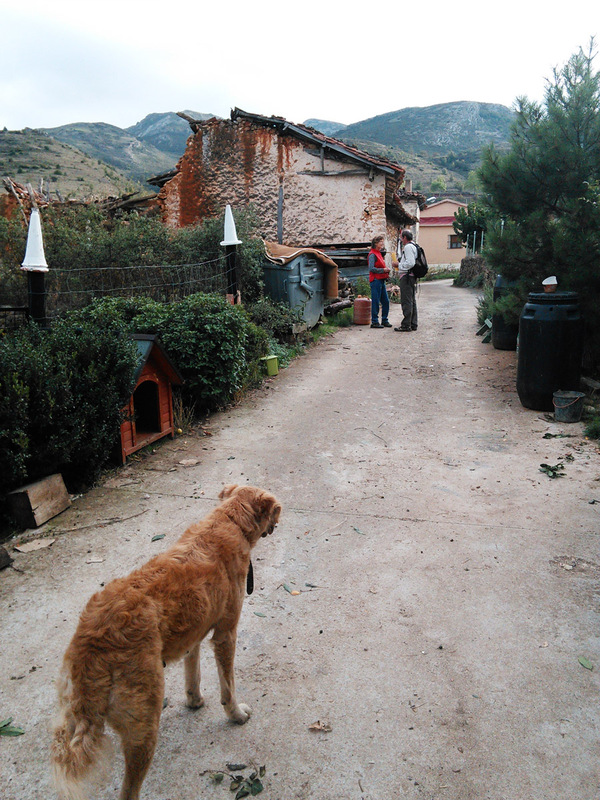 I didn’t have nearly enough time to spend with Dorien, Emilio and Edo, but they were wonderful hosts as always and I was very grateful for their warm welcome and hospitality. At the end of nearly a month of learning, discovery and new friendships, it was time to go home. 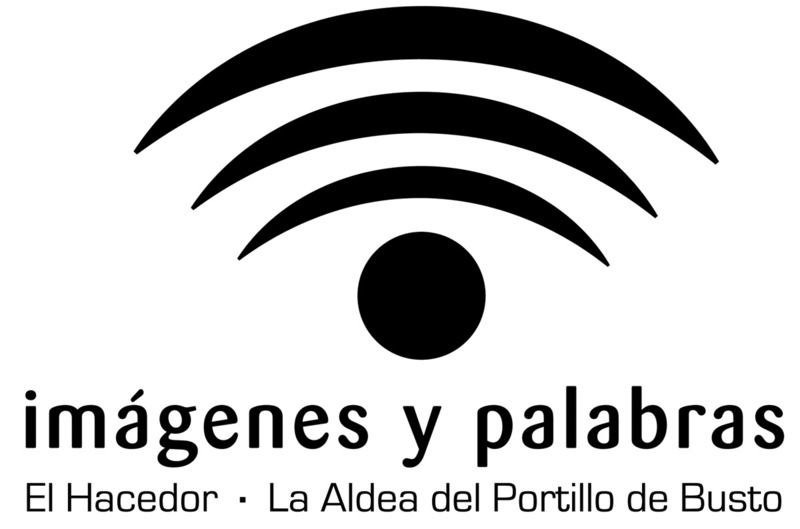 Gracias a tod@s – eskerrik asko – agur! Morning light, La Aldea del Portillo de Busto. 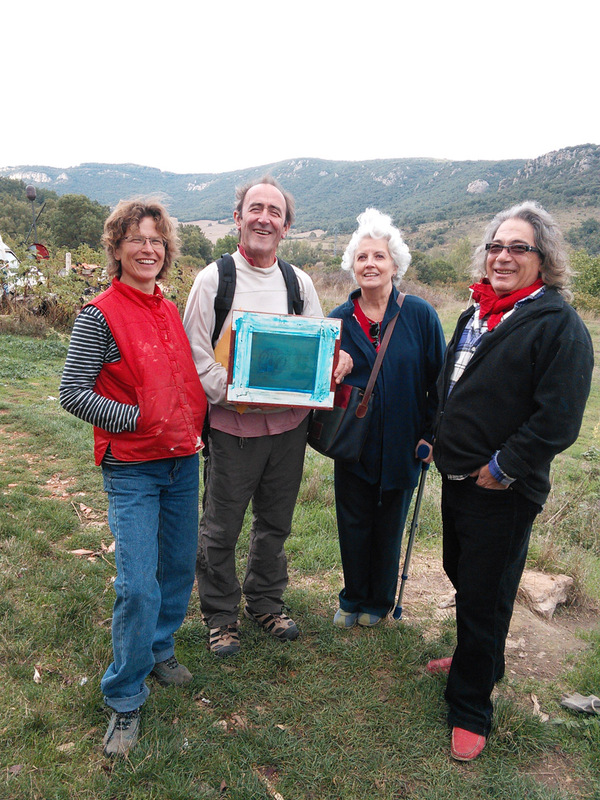 This entry was posted in art, Euskal Herria, Spain and tagged Basque culture, Boxa Arte Elkarte, El Hacedor, Garikoitz Cuitlahuac Murua Fierro, Hernialde, Spain, Tolosa on December 22, 2013 by Bill Horne.